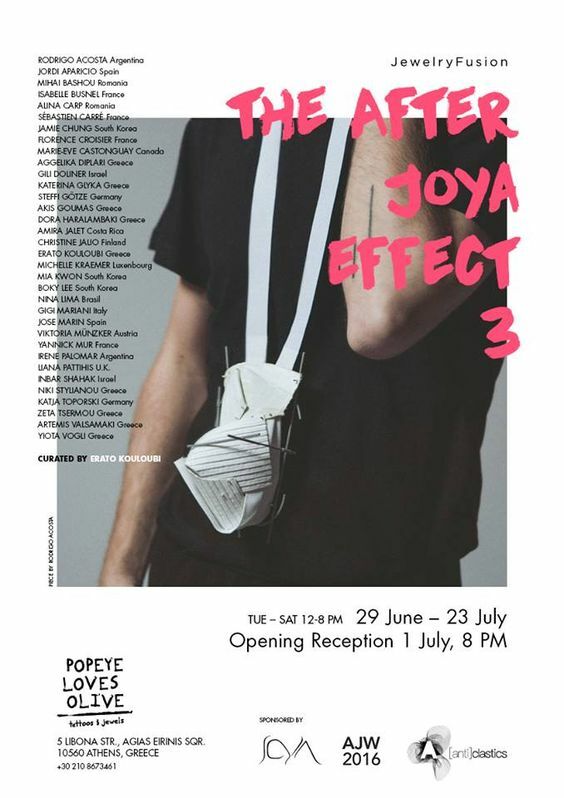 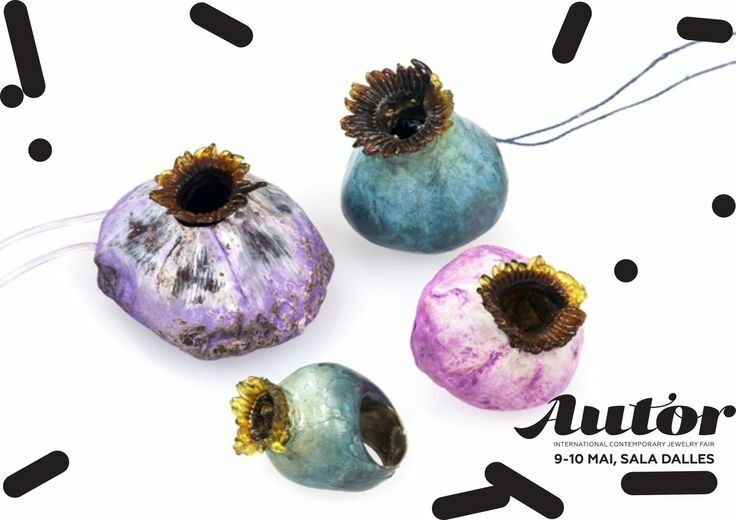 Exposición colectiva The After Joya Effect III que tendrá lugar en Popeye loves Olive – Art Space en la ciudad de Atenas, dentro del marco ATHENS JEWELRY WEEK 2016 …..
After its great success, we are happily heading to the third edition of « The after Joya Effect” Exhibition. 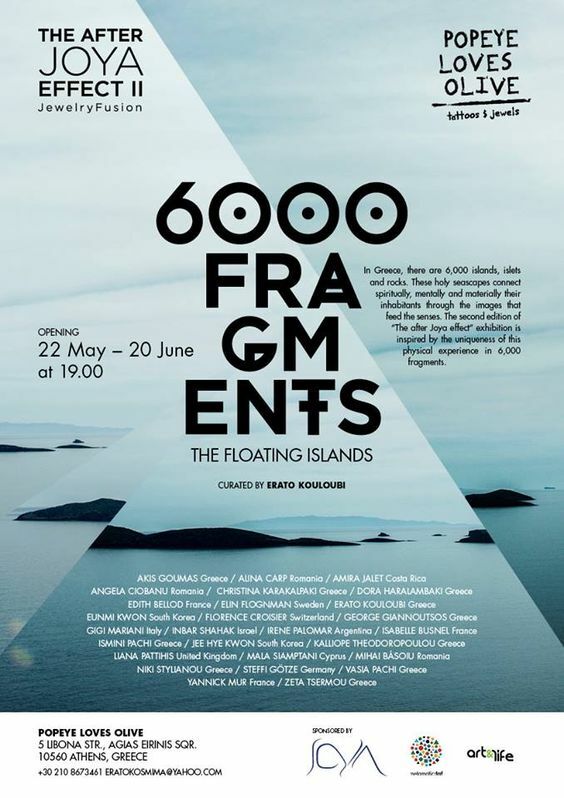 More than 50 Greek and International Artists had shown their work in our gallery, taking part in 7 Solo and 2 Group Exhibitions!! 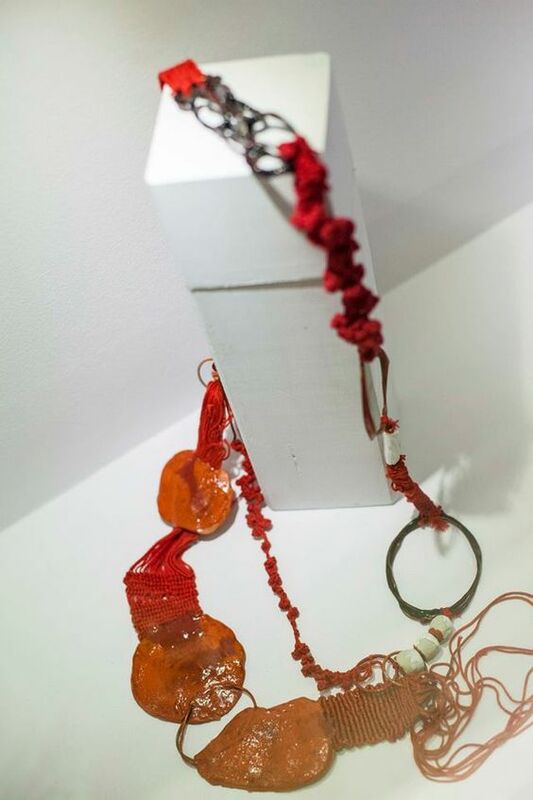 Popeye loves Olive – Art Space, sited in the historical center of Athens, aims to the interaction and the transformation of individuality to collaboration, diversity to unification and exchange to sharing. 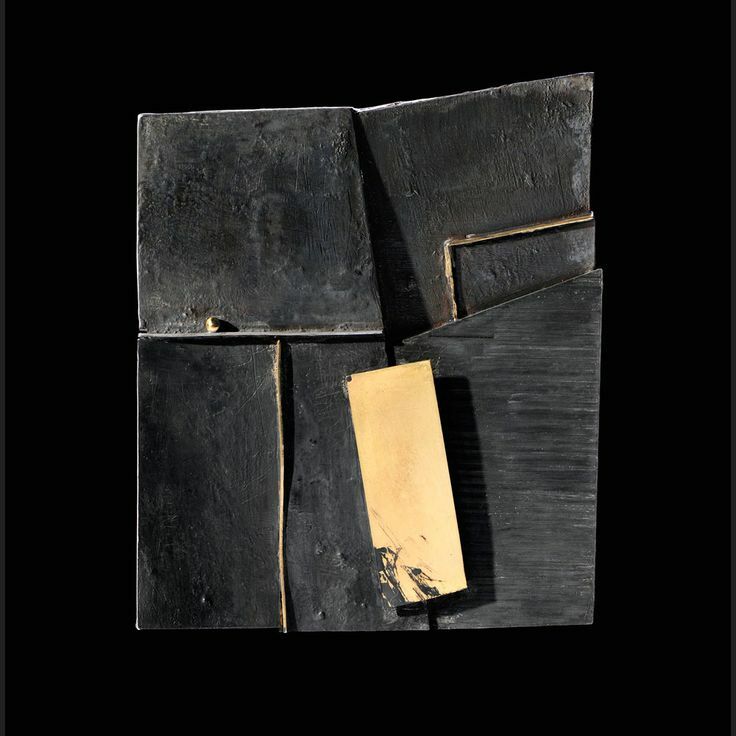 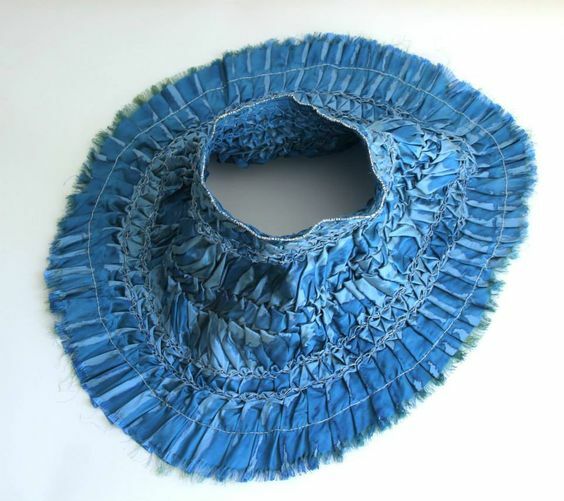 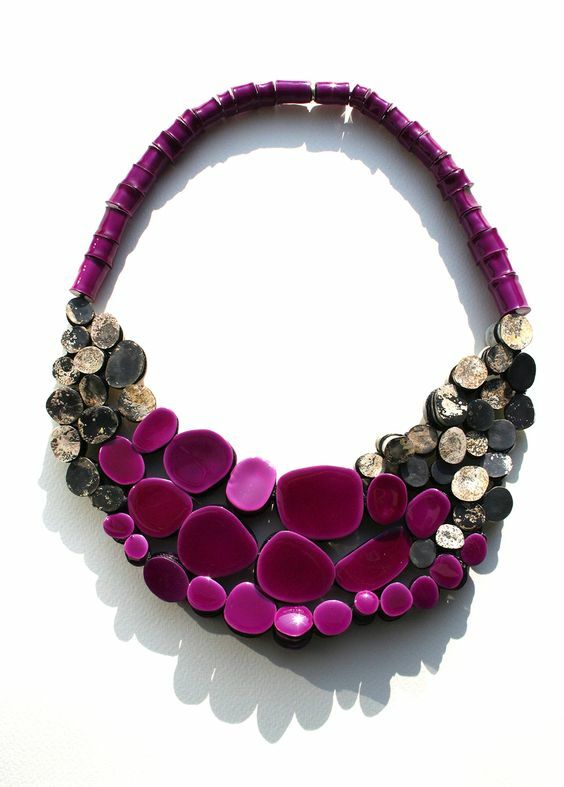 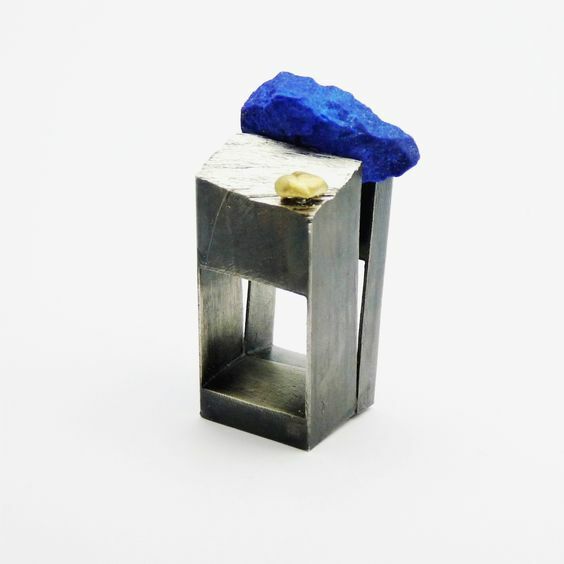 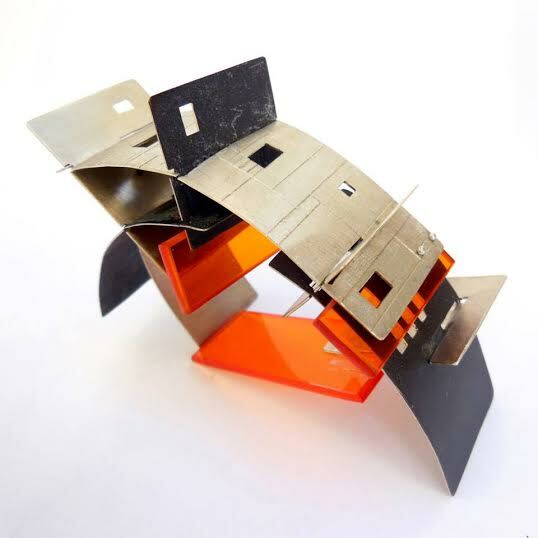 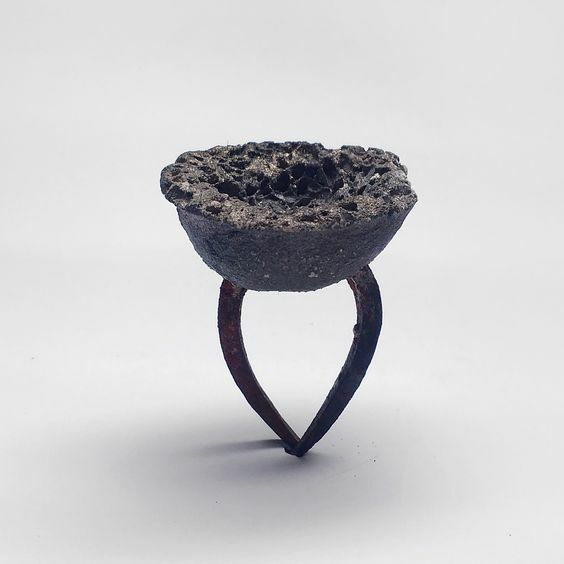 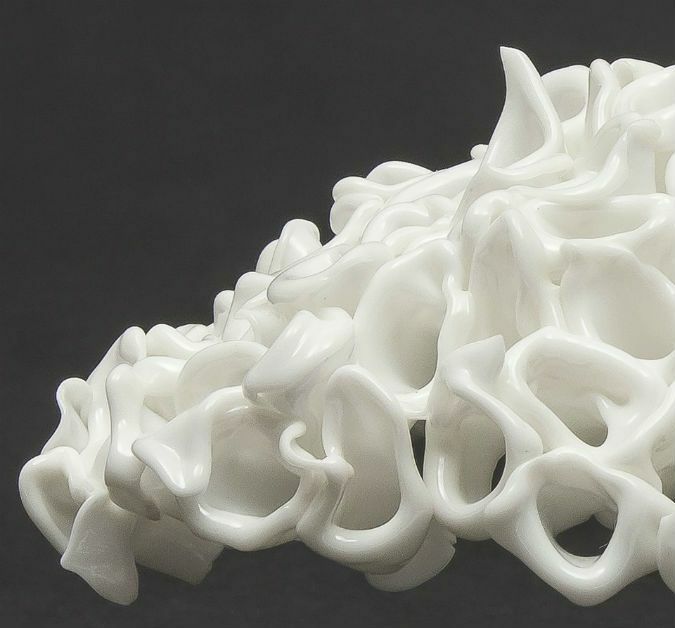 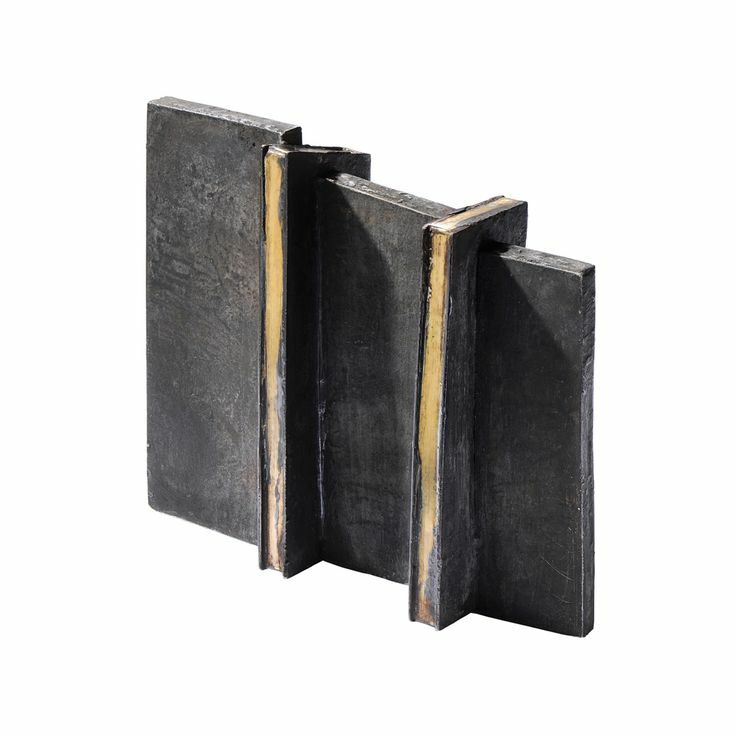 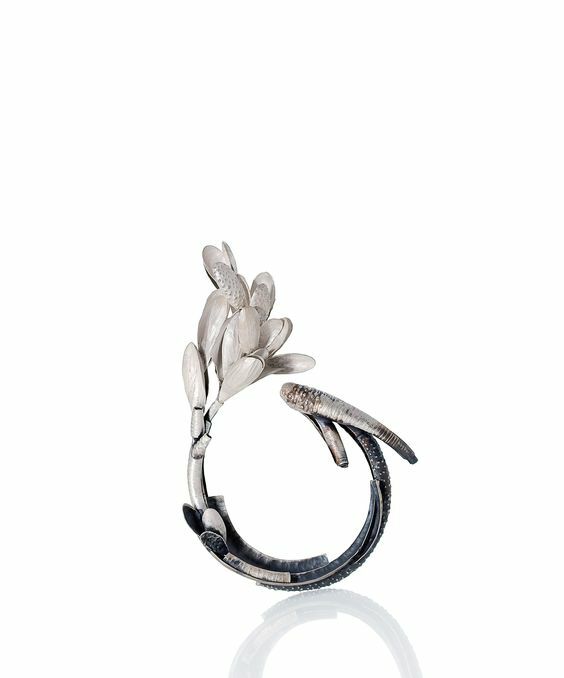 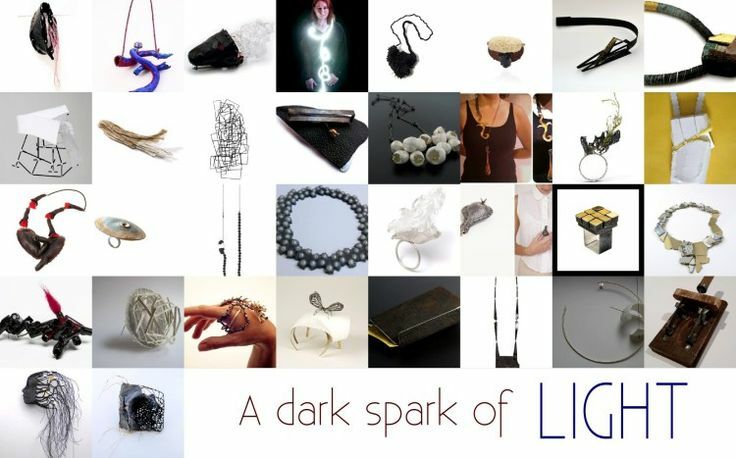 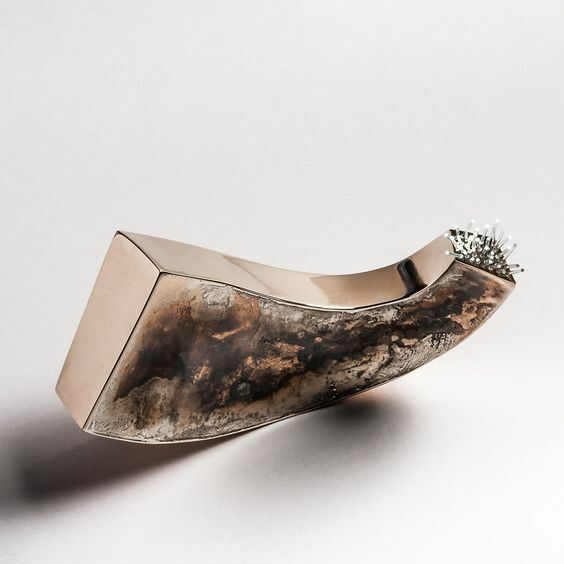 This year, 33 selected artists from 16 different countries, are called to participate in the project, with the work shown in Joya Barcelona, Jewelry Art Fair, the previous year. 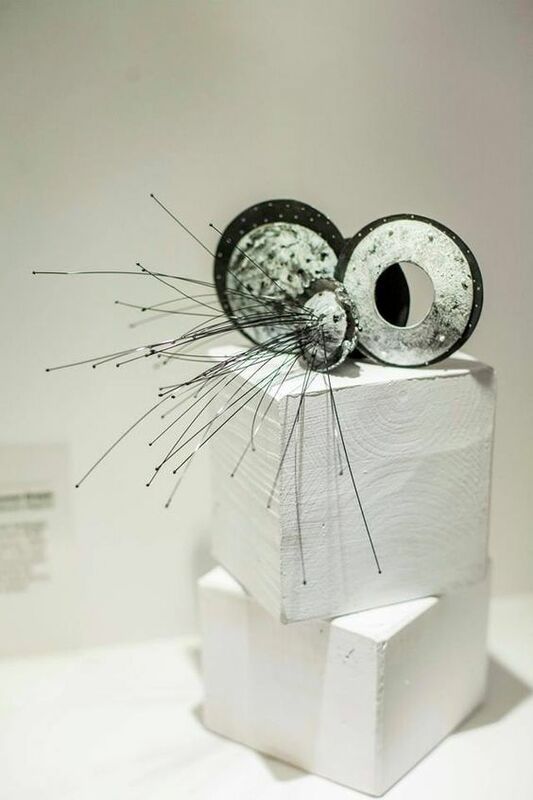 During the event, once again, the public, will vote for their favorite artist, who will be invited for a Solo exhibition at Popeye loves Olive – Art Space. 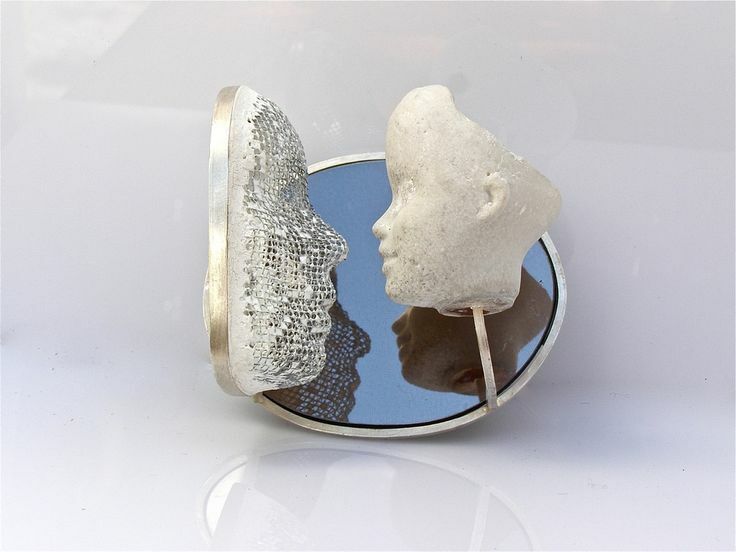 Alina Carp de face, de profil, tout est beau ! 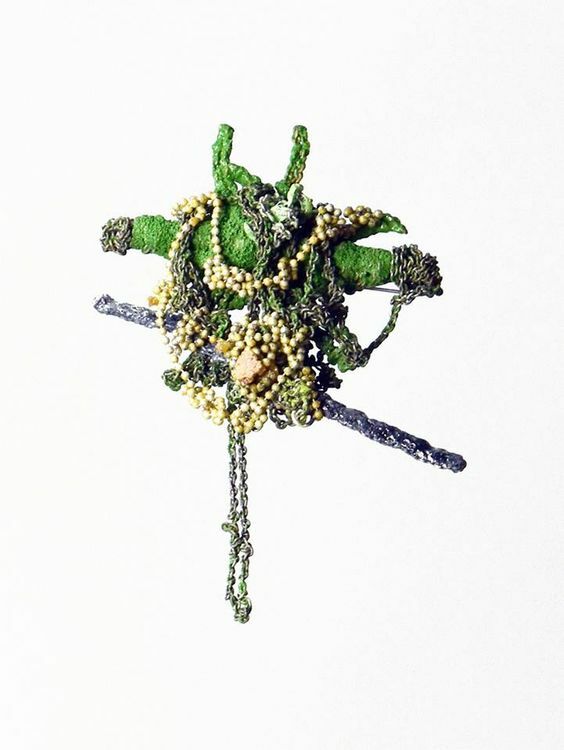 hommage …..
« Some of the pieces that I presented in Joya were about one of the essential myths of Romanian folklore. 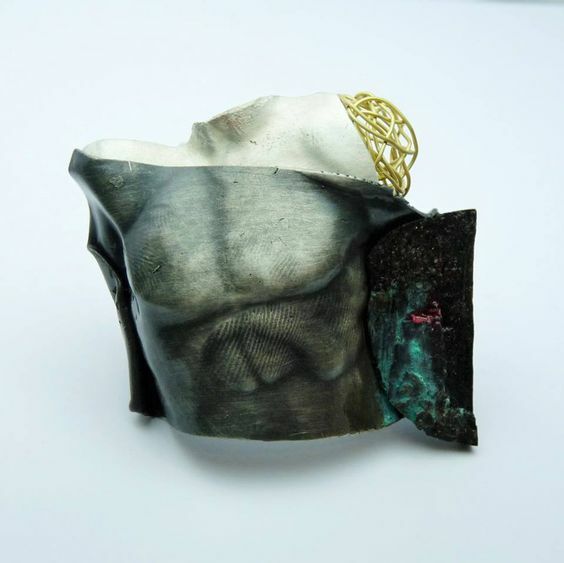 I documented by reading Mircea Eliade’ s “Comments about the Legend of Master Manole” It’s a legend full of emotional and even if not singular in the European area (there are Bulgarian, Serbian versions), many people did not know it and were heavily impressed. 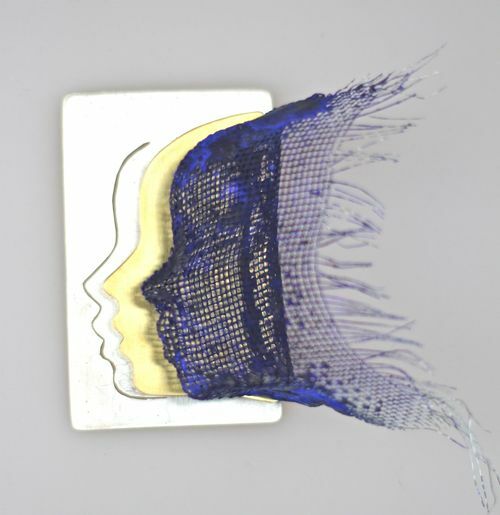 One of the brooches represent a bright Ana and her spirit, a face like a transparent aura, immortalized in the wall. 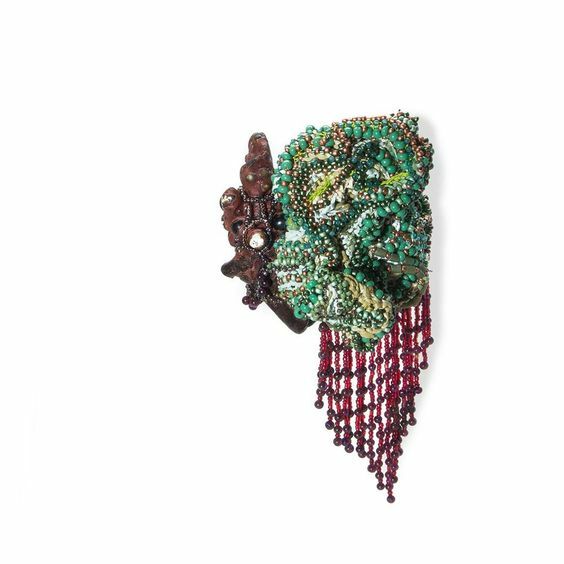 On the back of the brooch, on the part that is not seen, there is another face, hidden, that only the one who wears it knows about it. 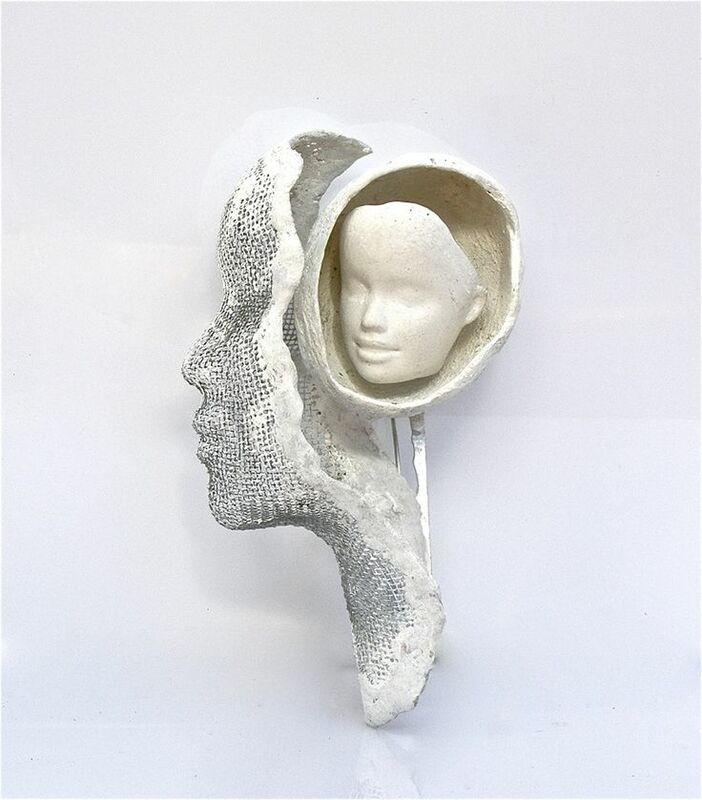 That unseen face represent the sacrifice that we all do for our accomplishments in life and only us know the measure of it. 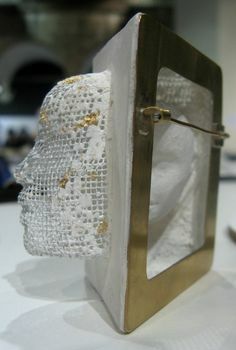 The audience was visibly interested in the history full of emotional and many returned to my booth accompanied by friends, especially to see this piece and asking me to tell the story over again for their companions, Even the organizers of the fair, captivated by the story, often brought visitors to my stand, showing them the brooch and telling them the legend they got to know by heart. 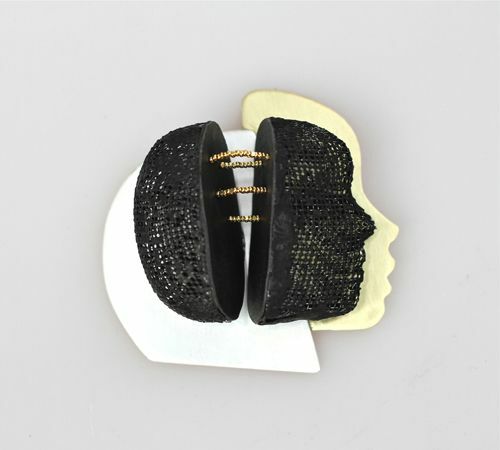 » Alina Carp – « Undisclosed » – brooch – 2014 – steel mesh, silver, brass, resin, pigments, hematite. 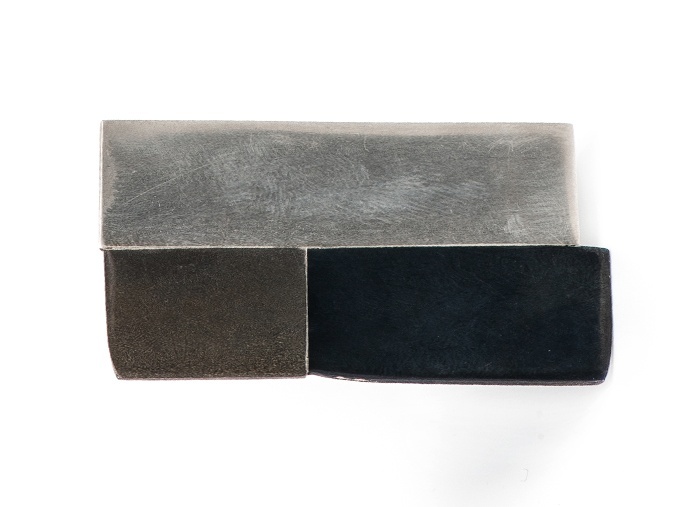 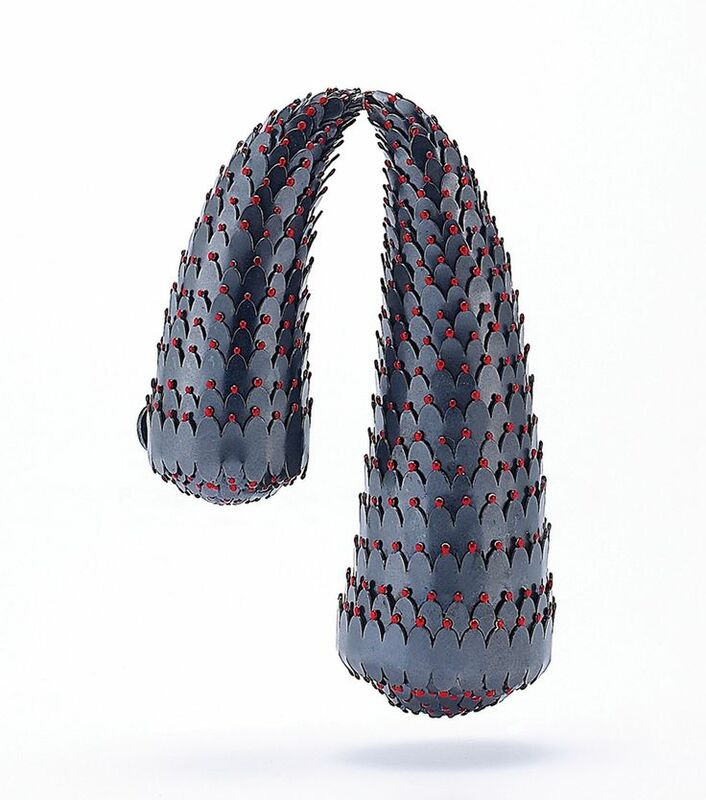 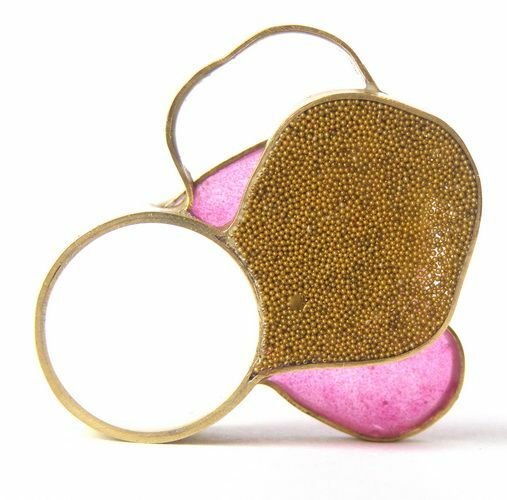 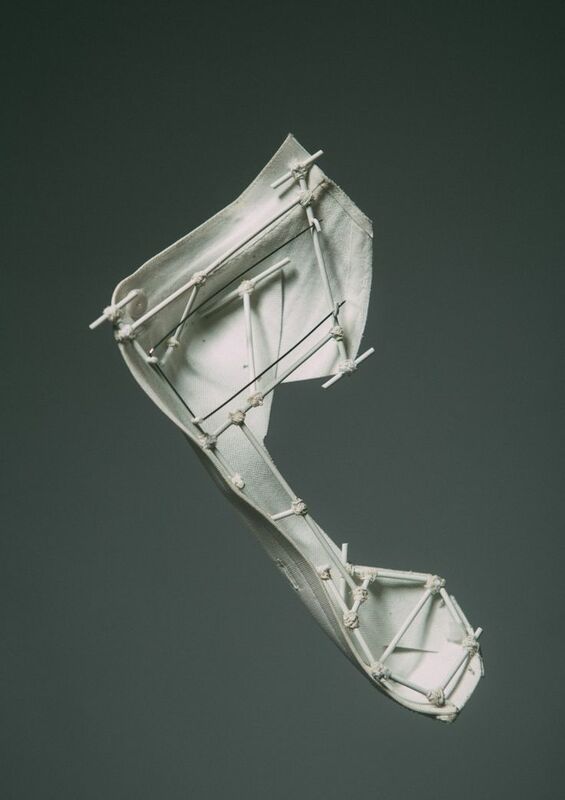 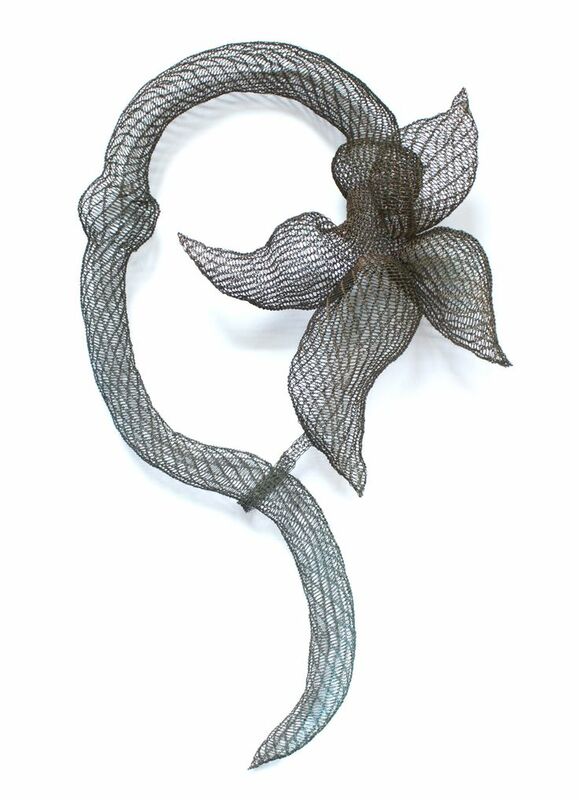 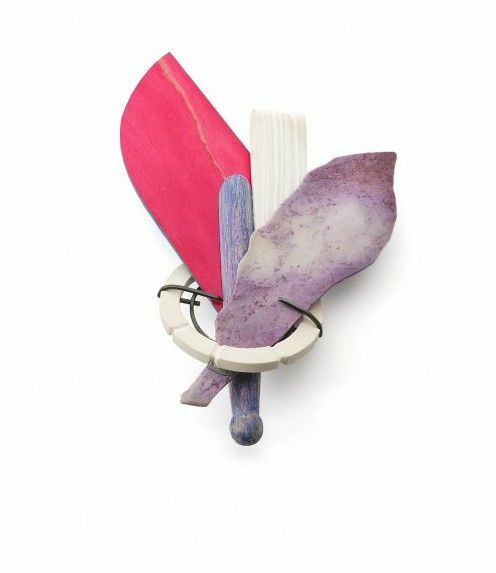 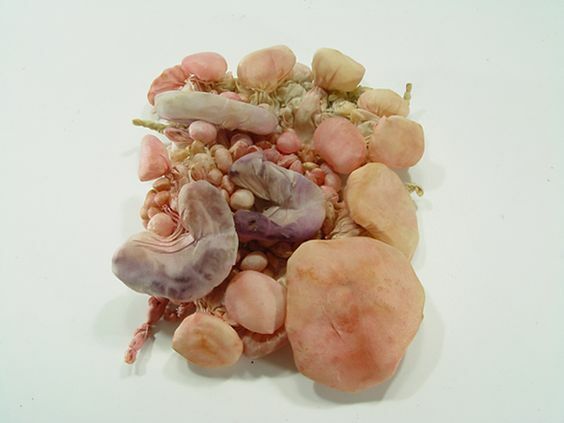 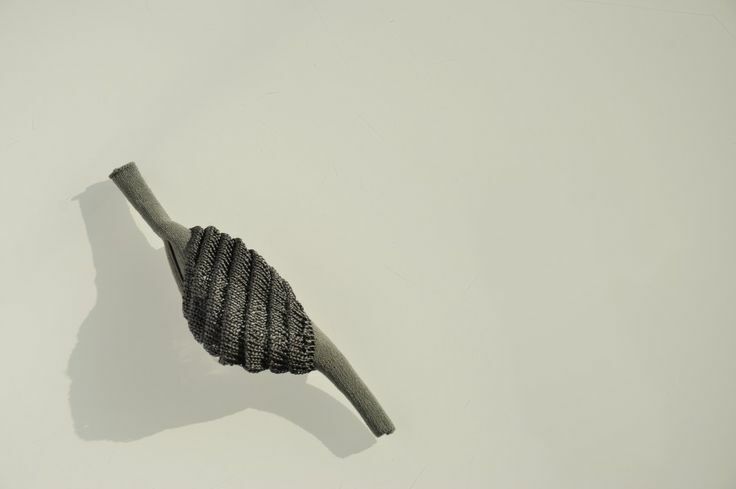 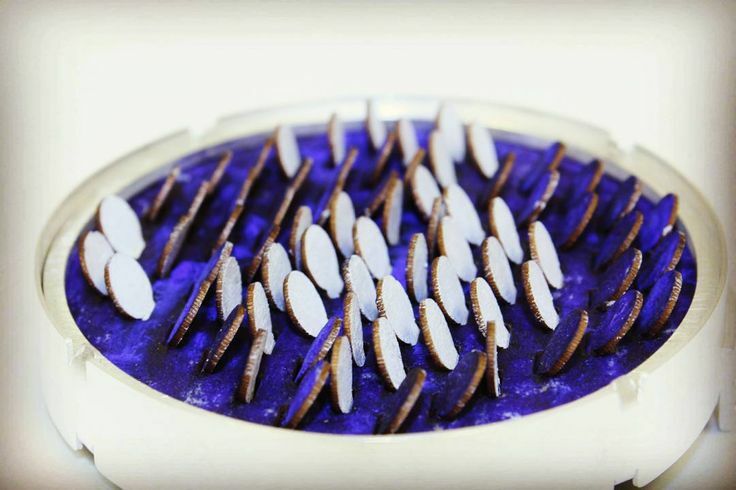 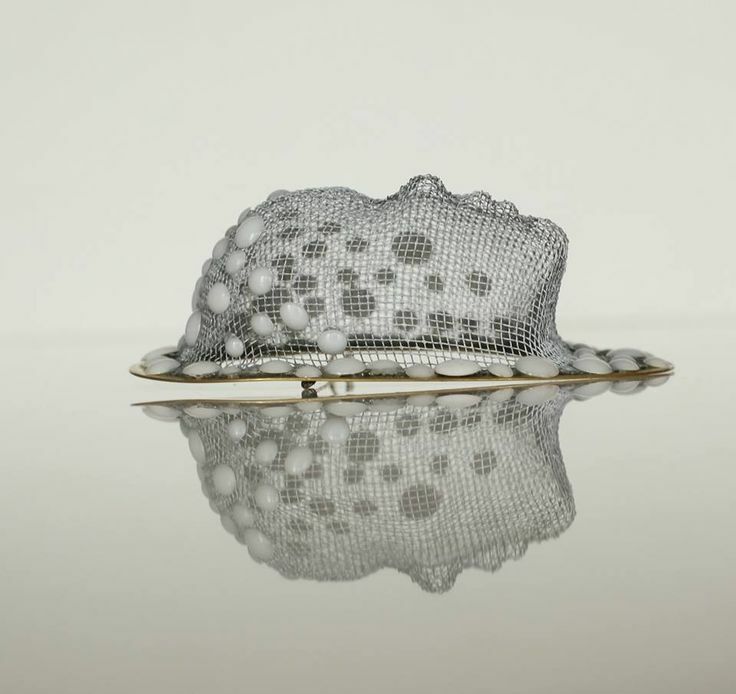 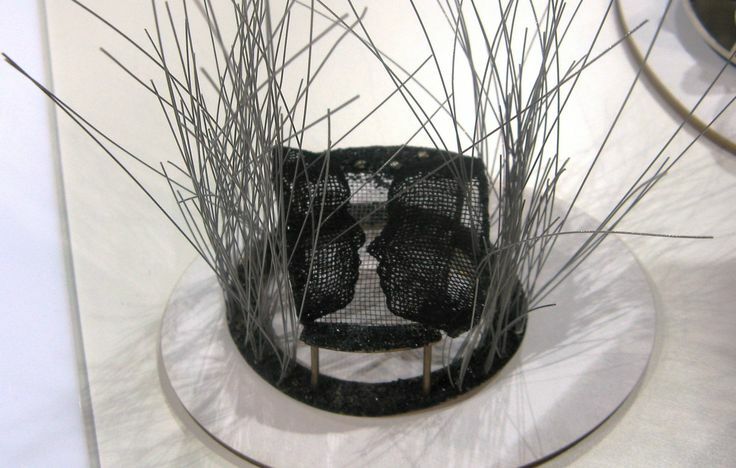 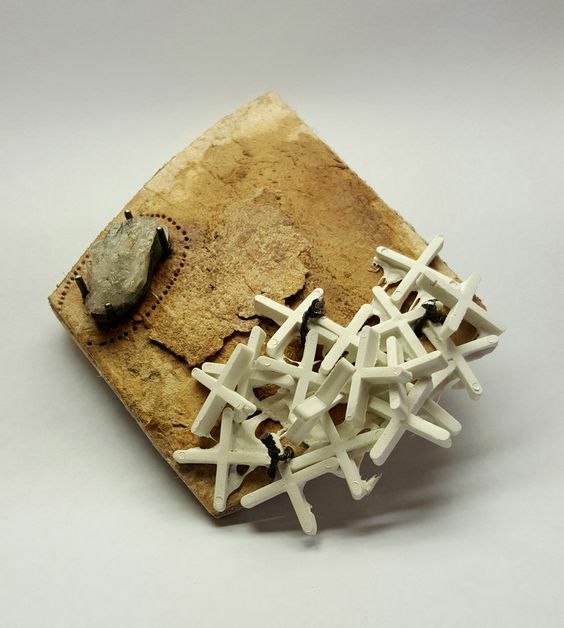 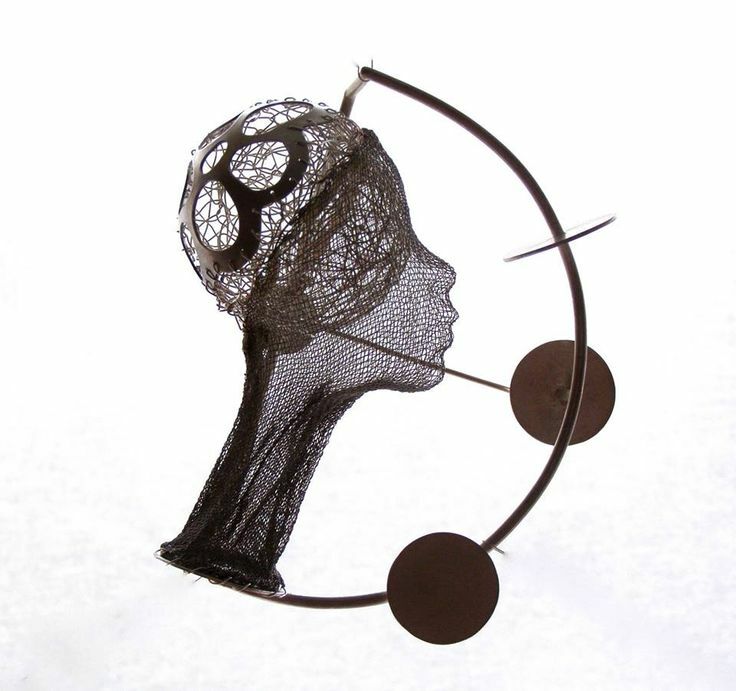 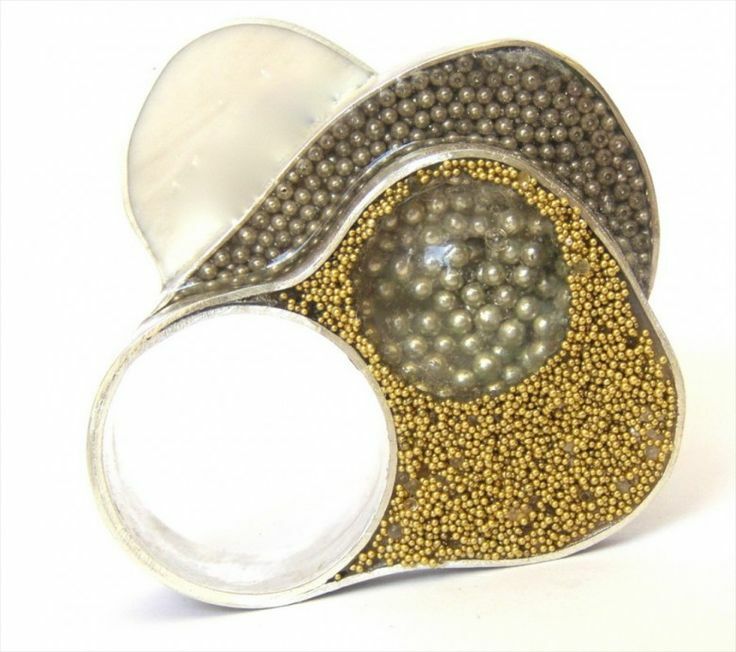 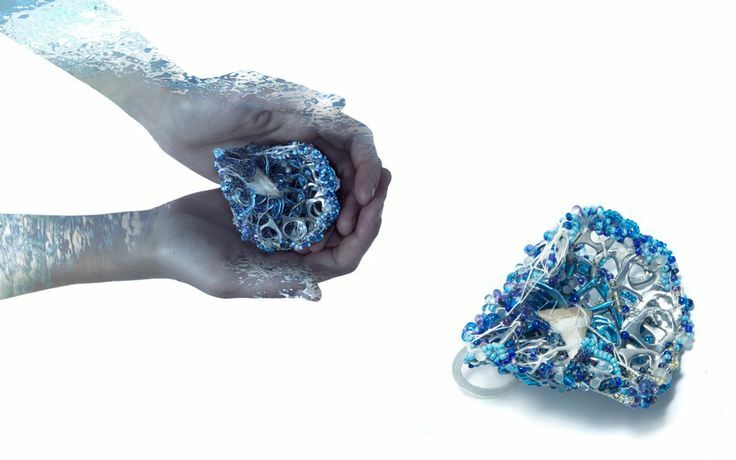 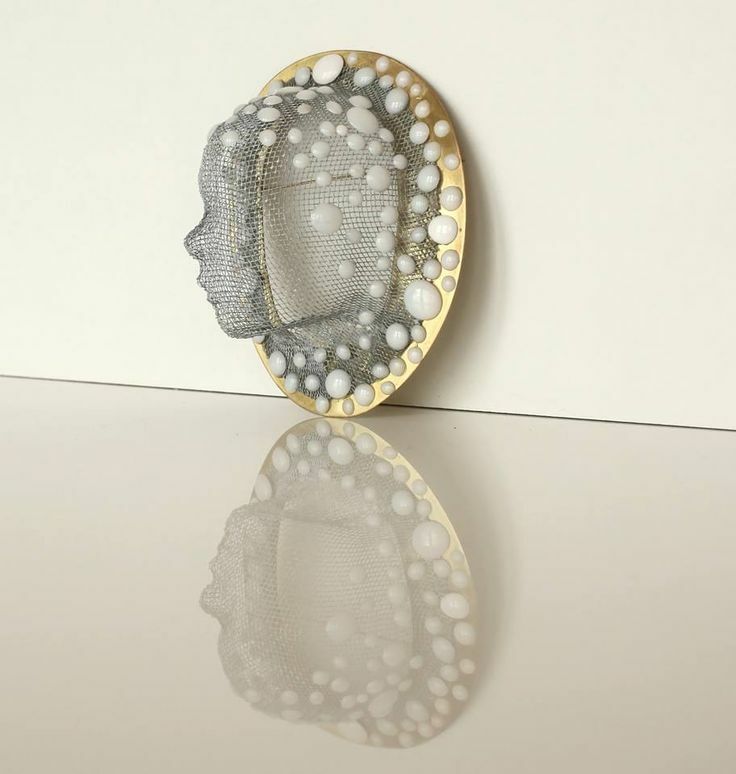 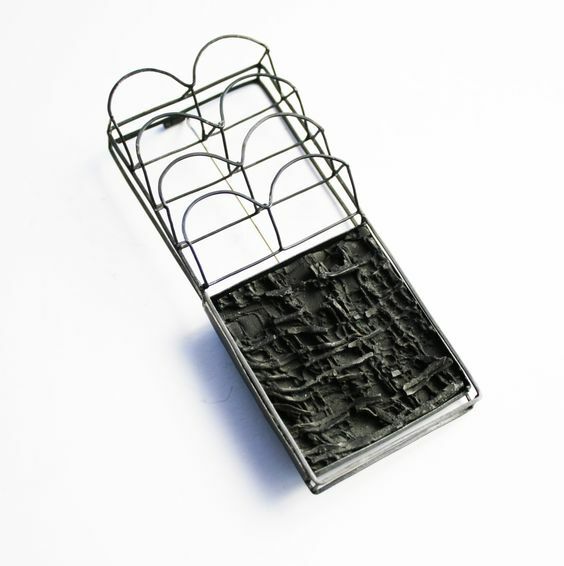 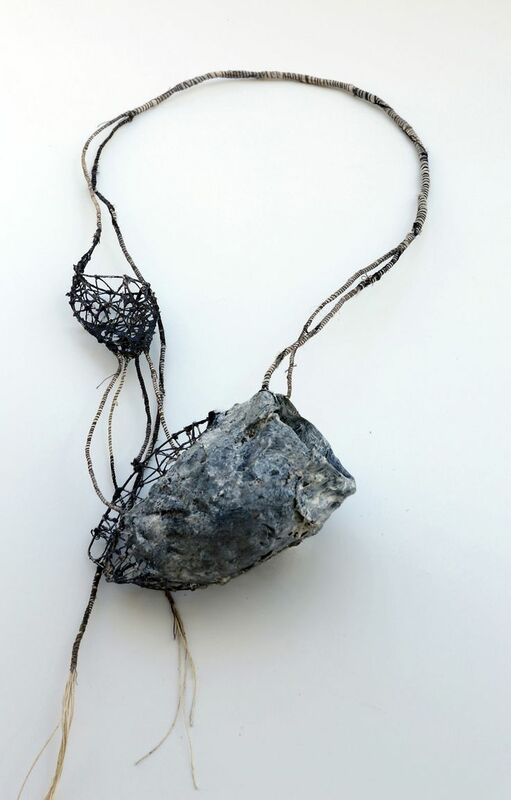 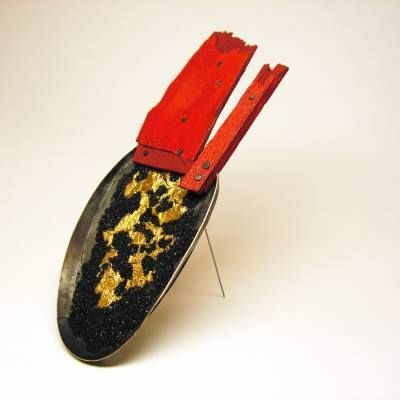 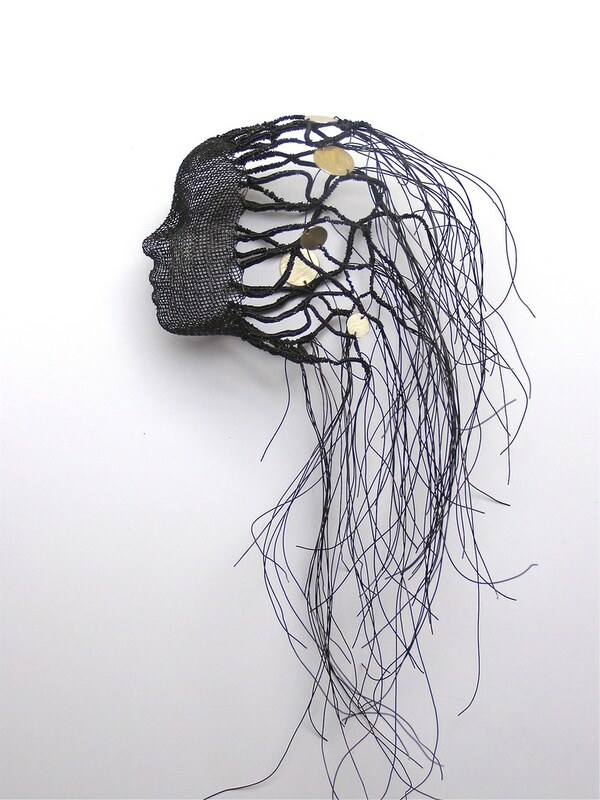 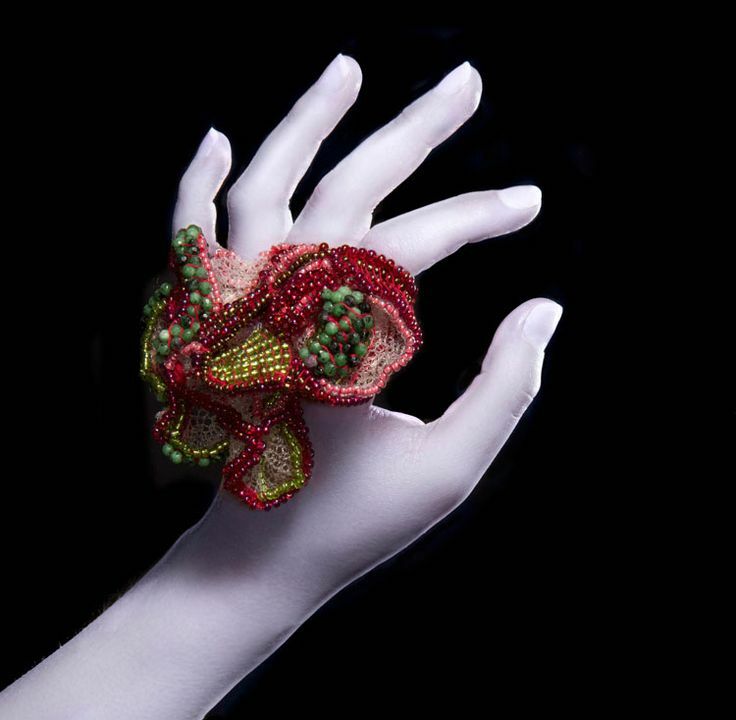 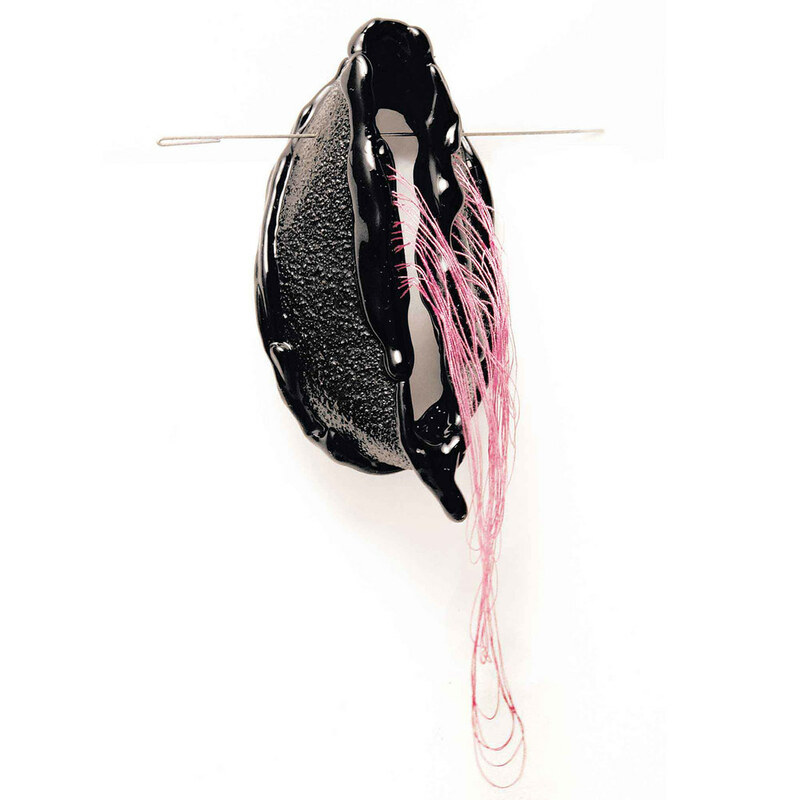 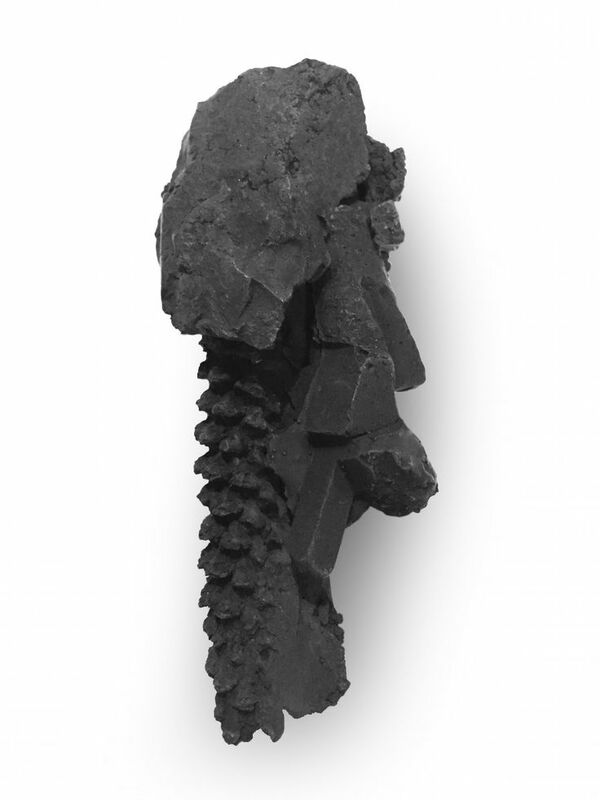 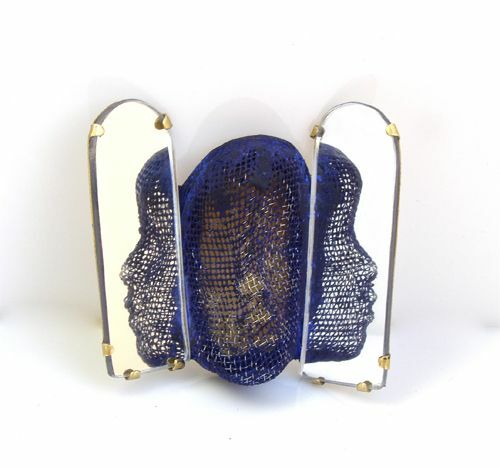 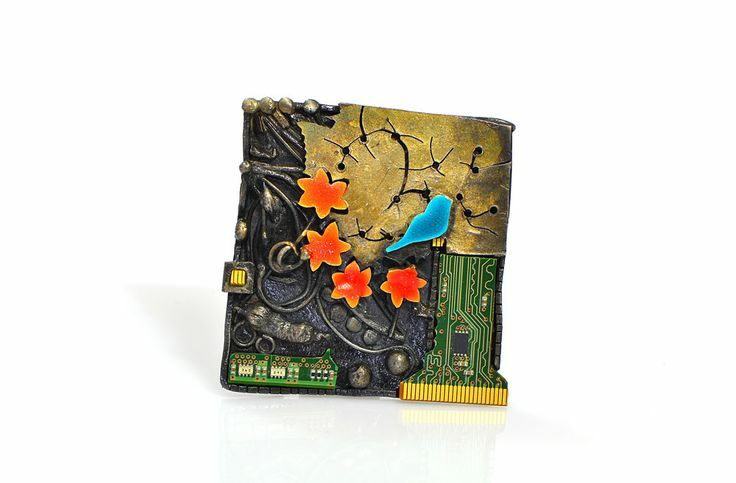 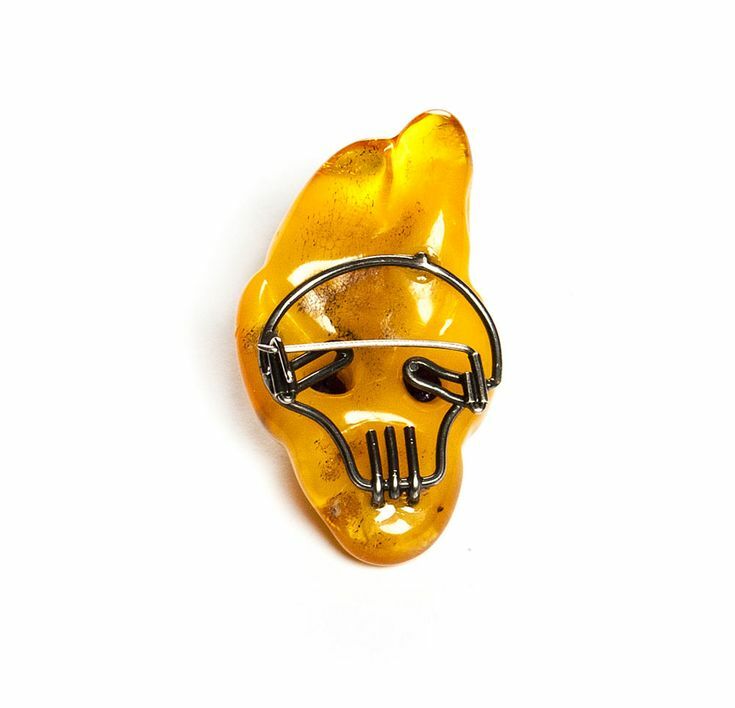 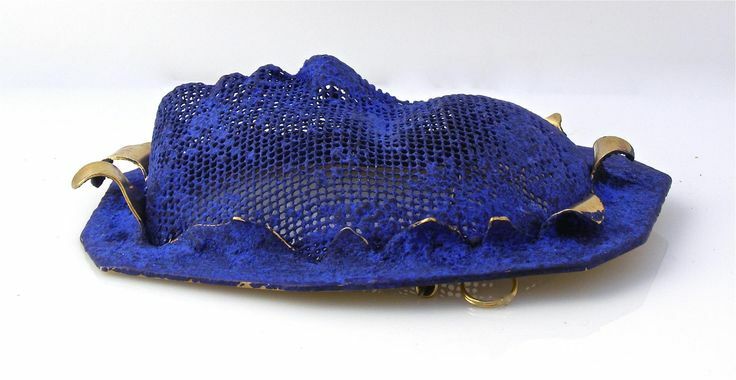 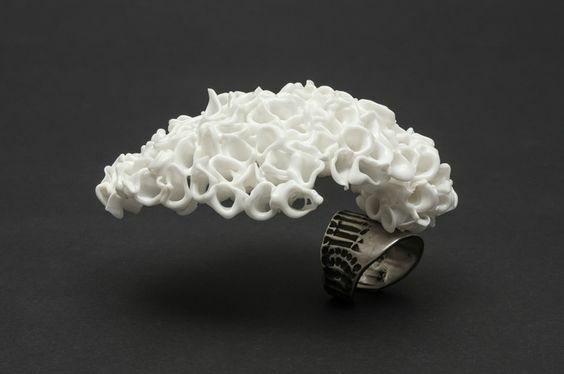 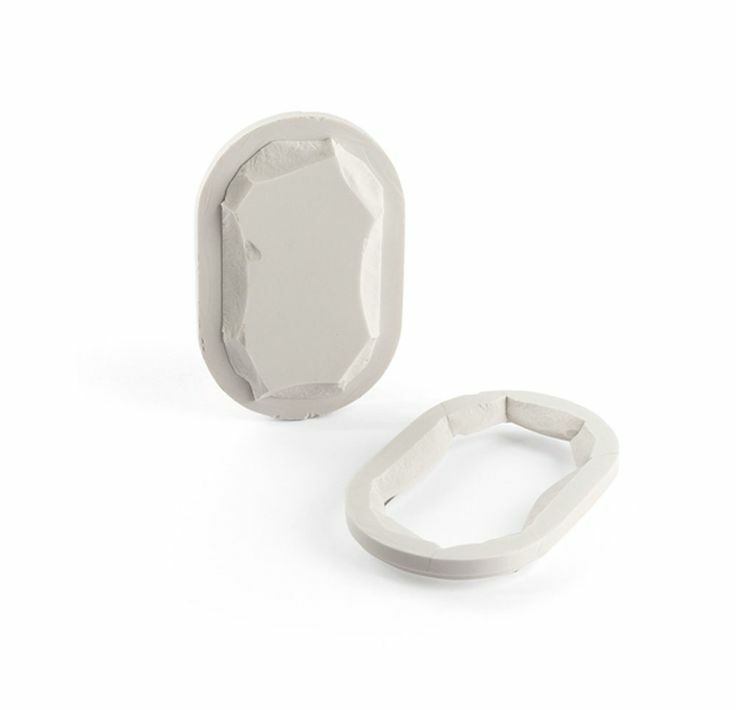 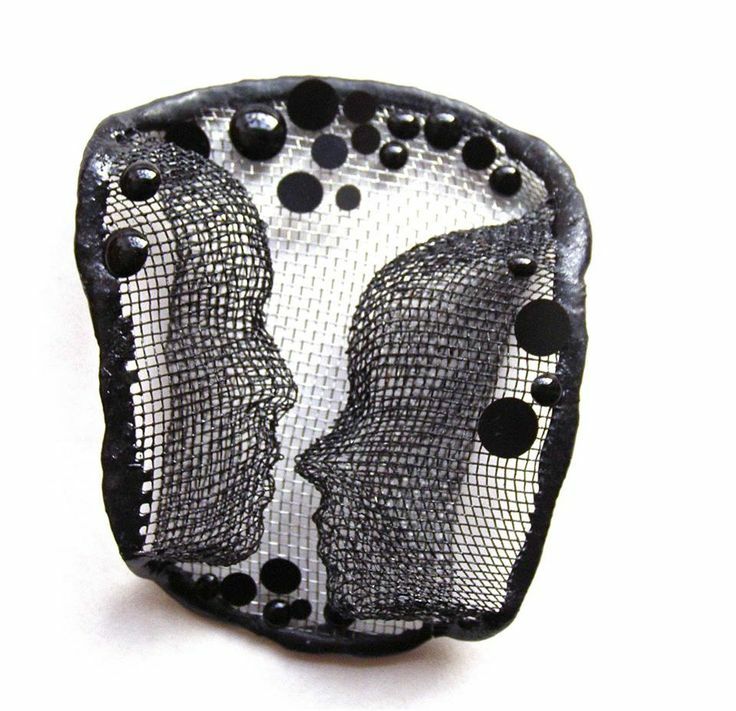 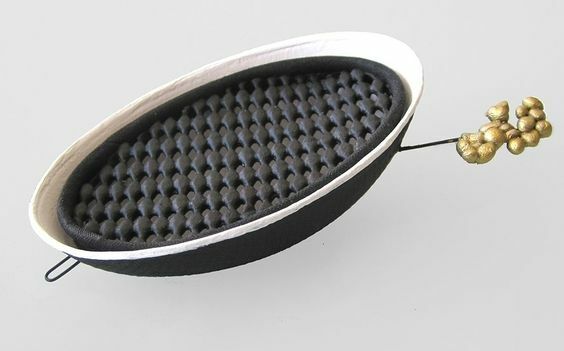 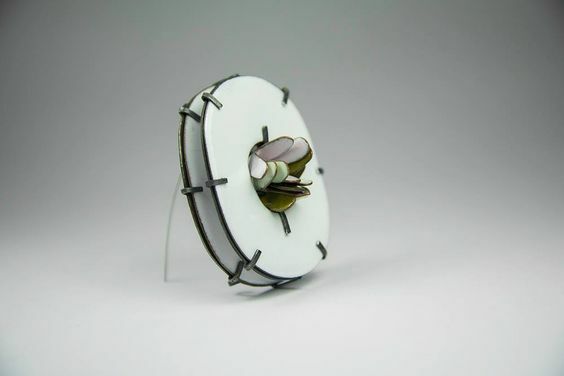 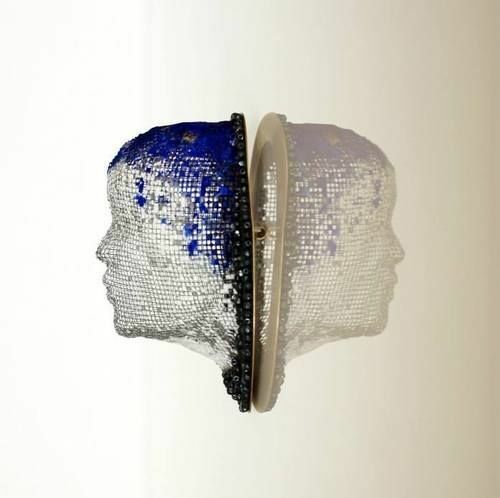 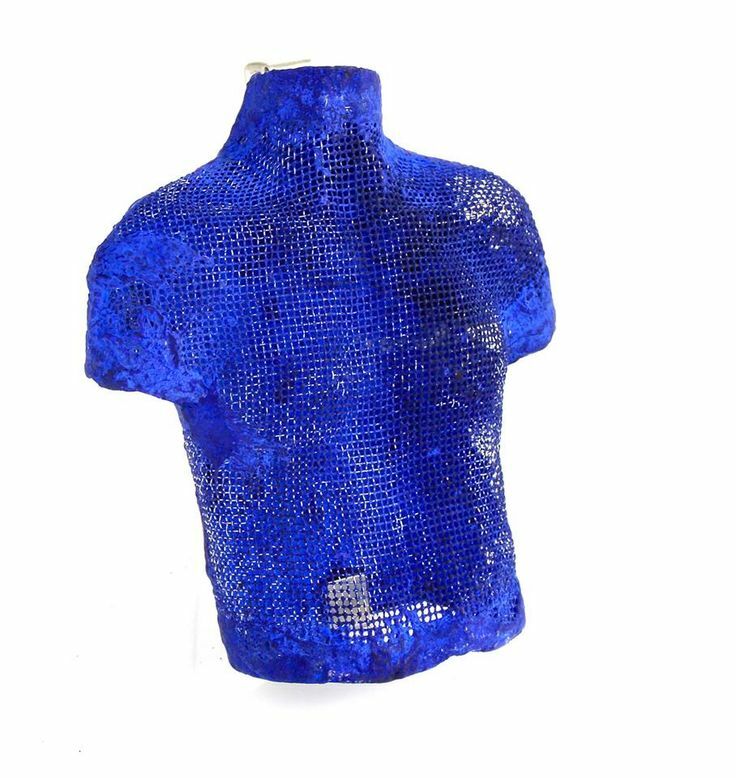 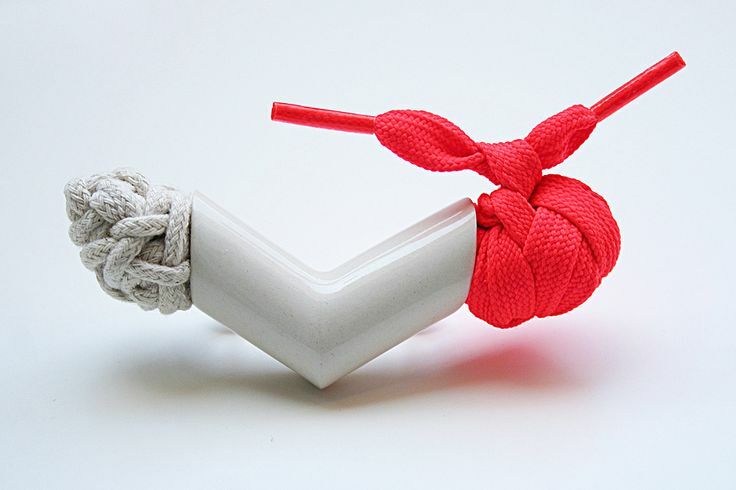 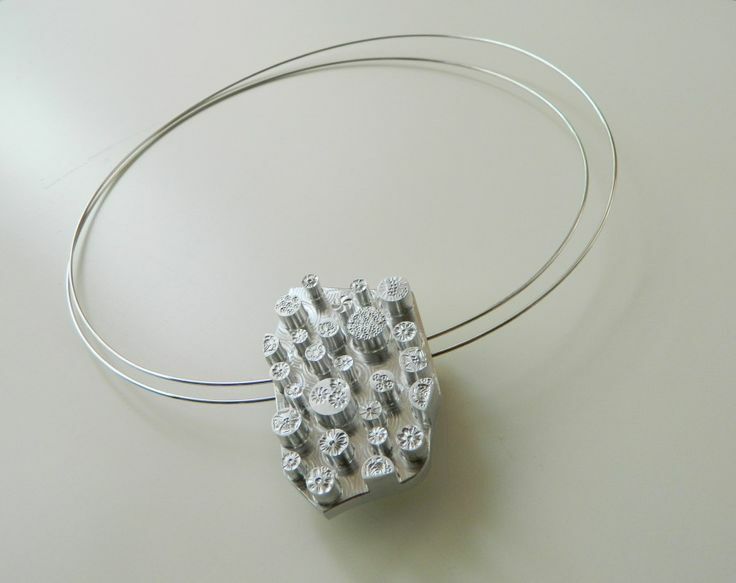 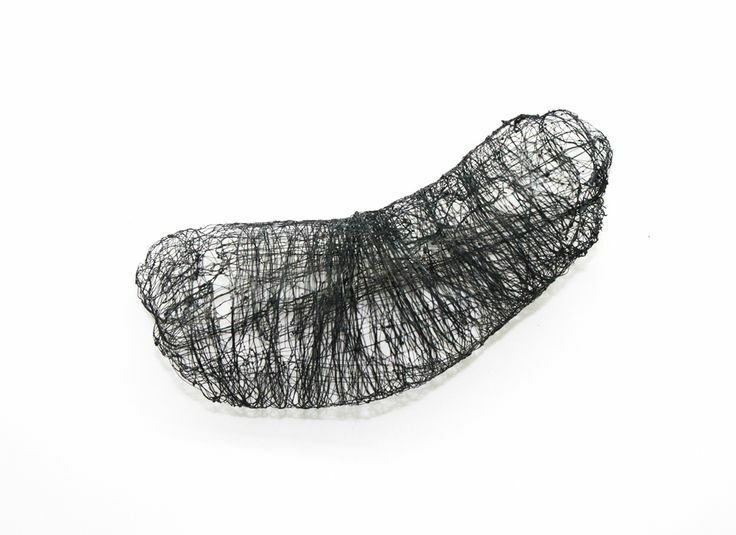 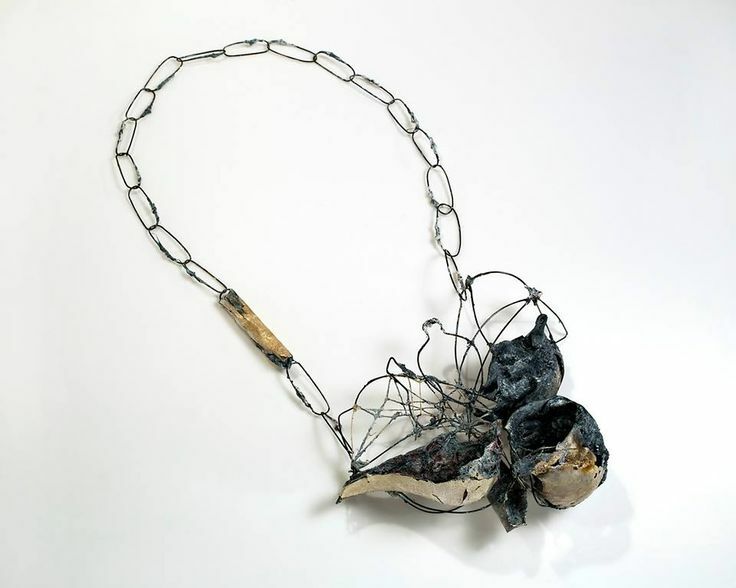 Alina Carp – brooch « Inamorato », made of steel mesh, resin and silver. 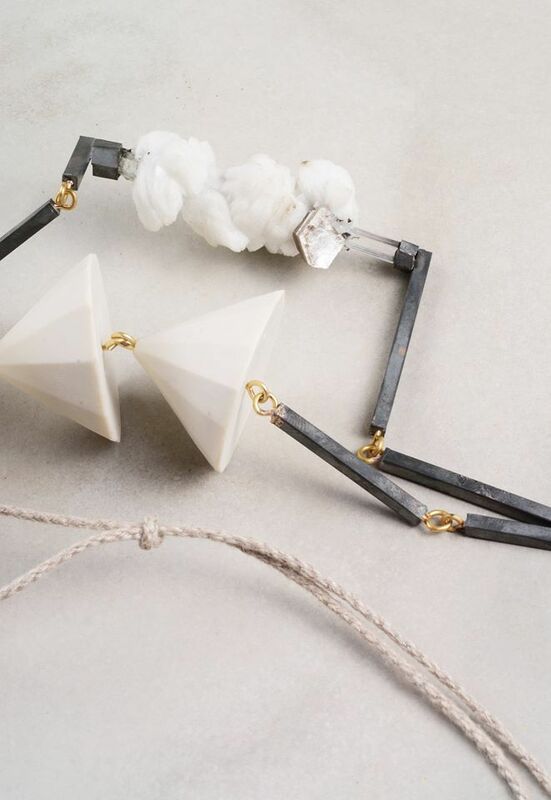 White Dreams are coming true while wearing it ! 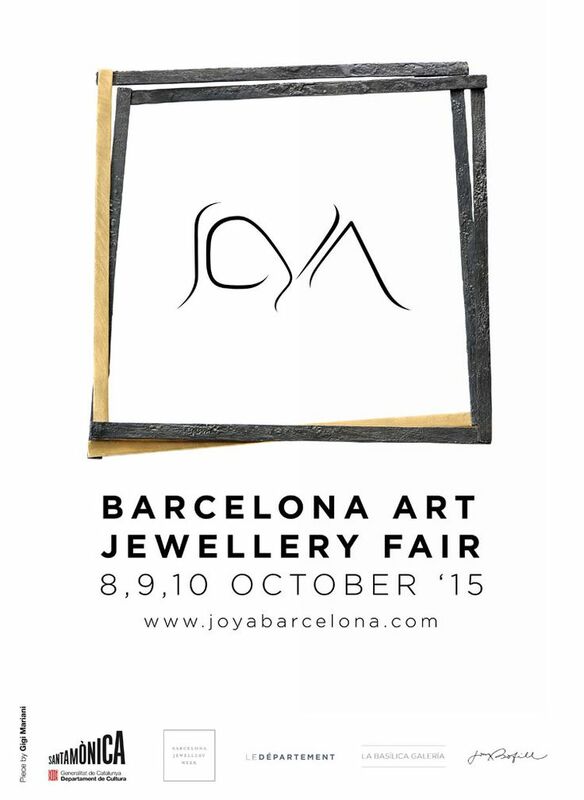 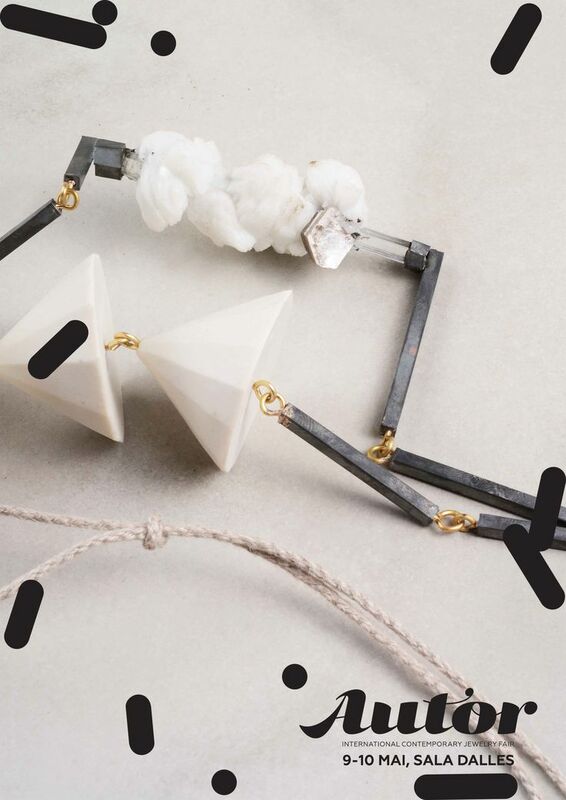 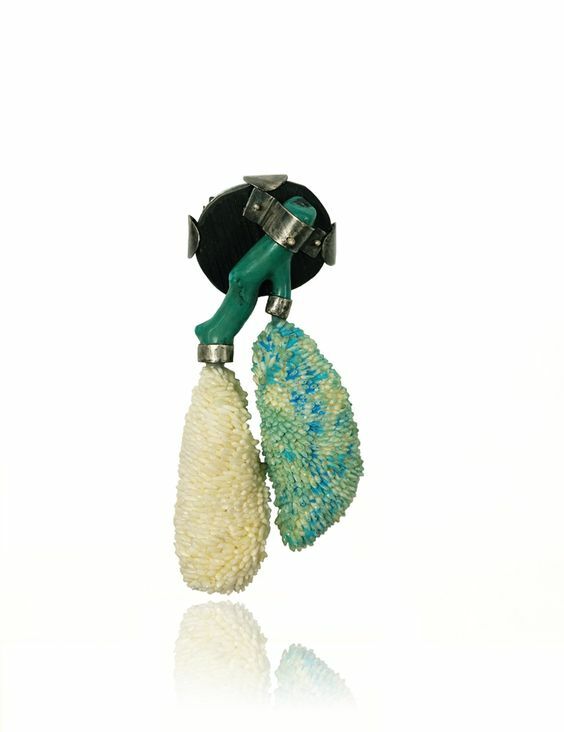 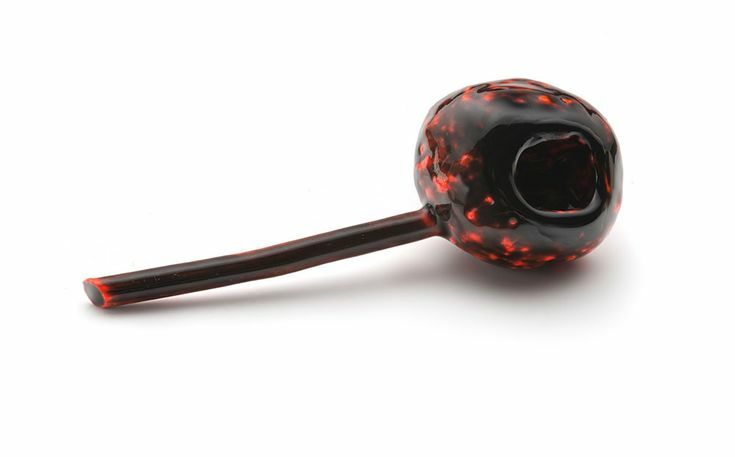 Name of Collection: Undisclosed, presented in JOYA Barcelona – Joyería Contemporánea october 2014. 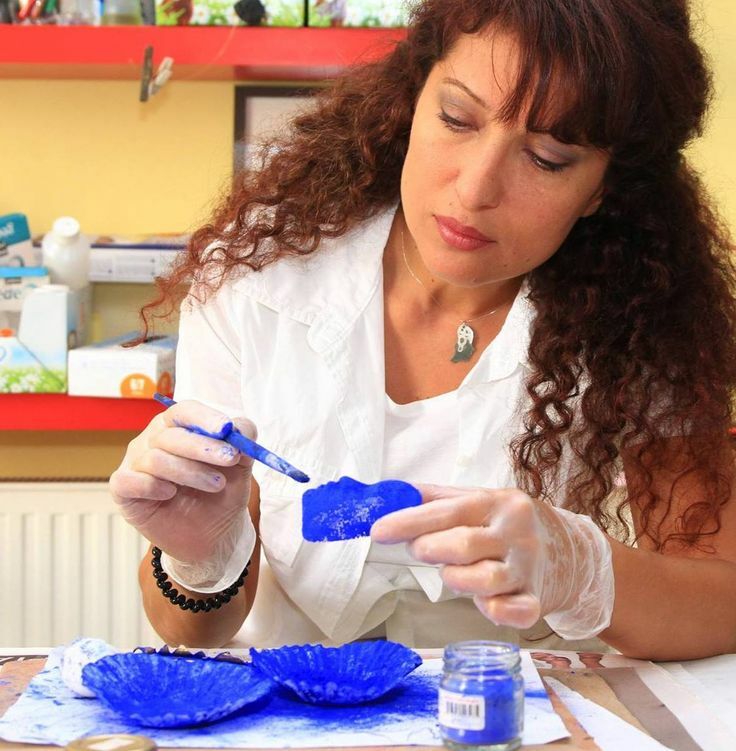 A long article on her work HERE, but all in romanian ….. more english HERE … It’s not her life i’m interested in (she was a doctor, she became a jeweller … among several jewelry courses she had a training at Alchimia (2012) …. 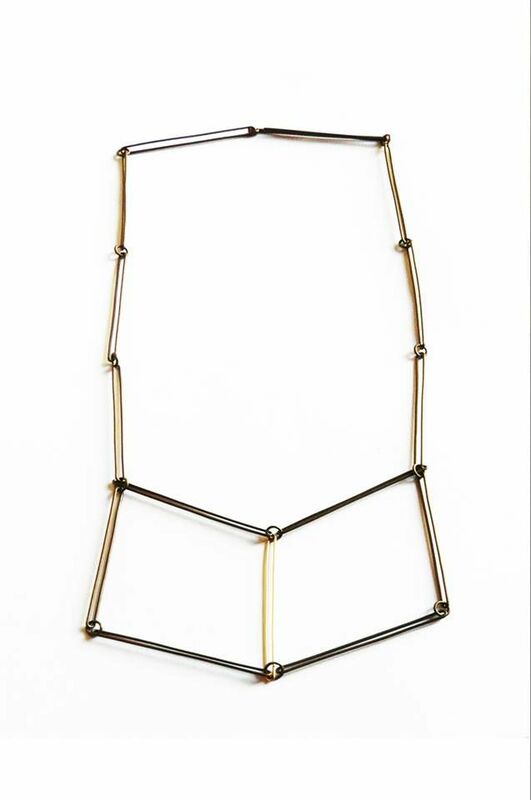 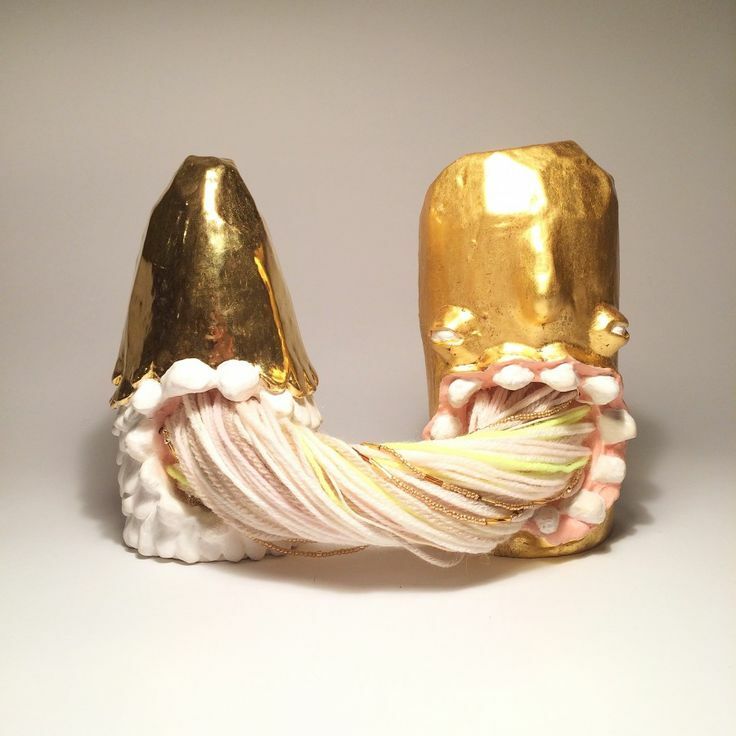 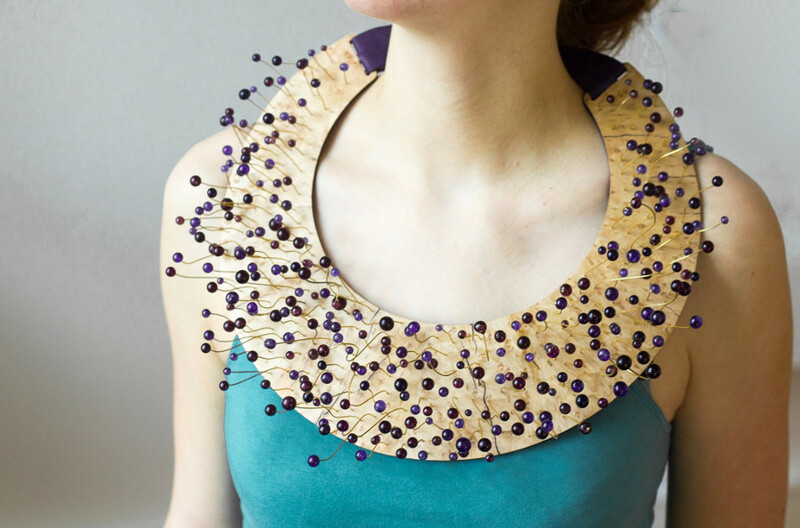 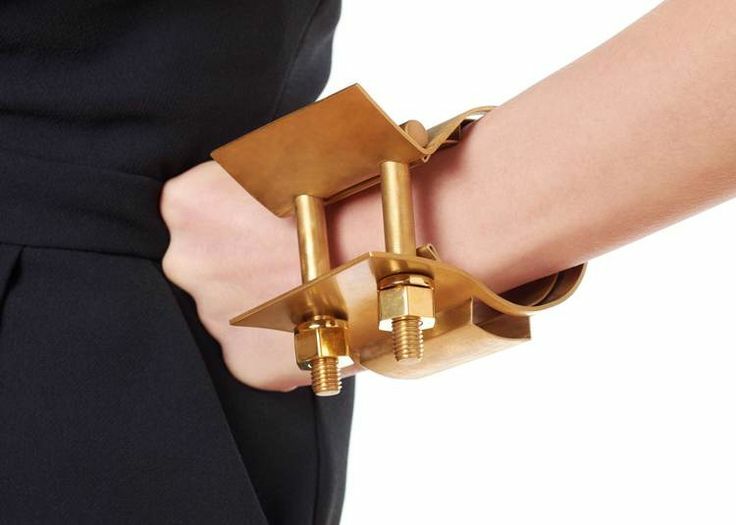 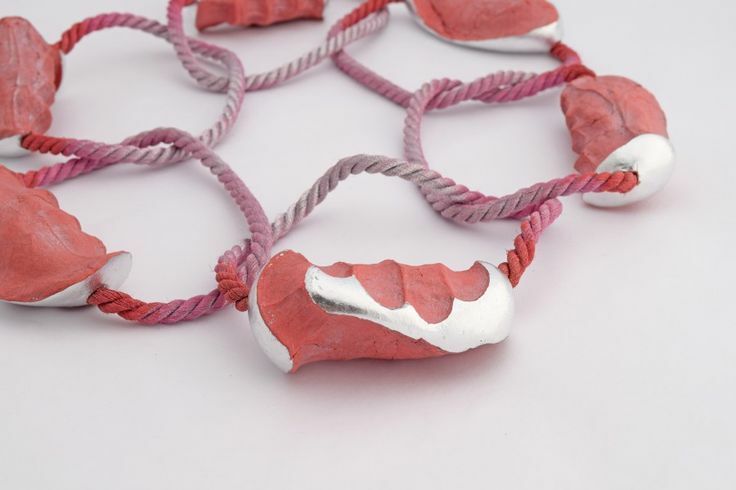 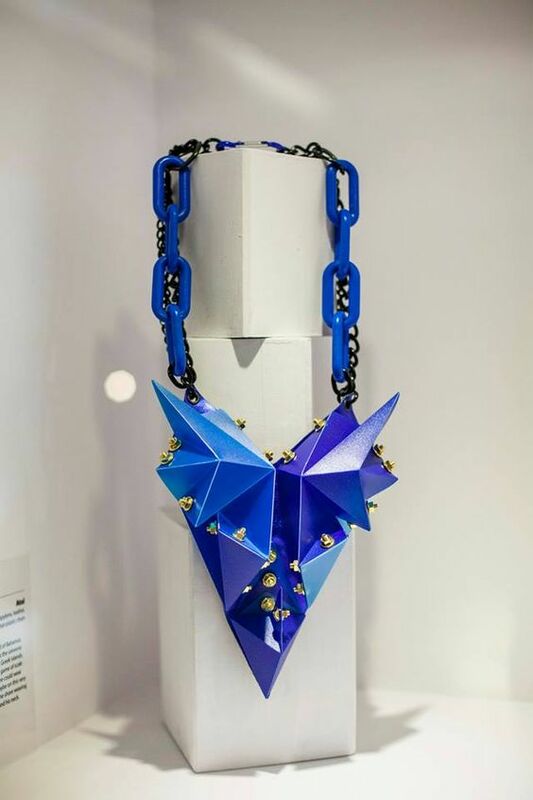 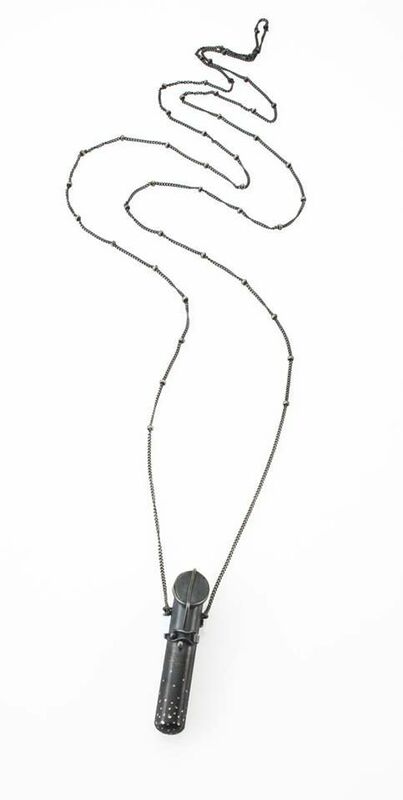 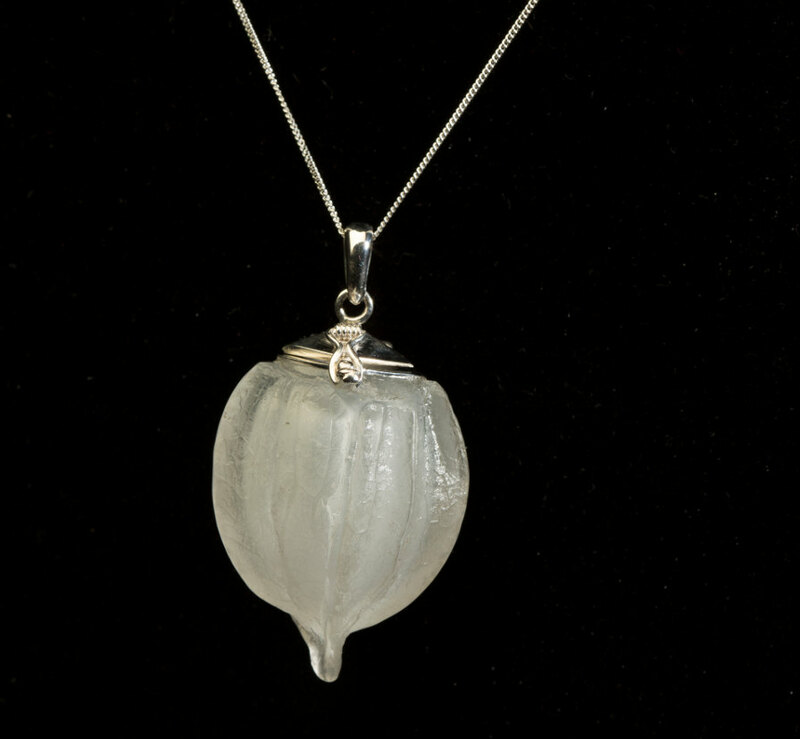 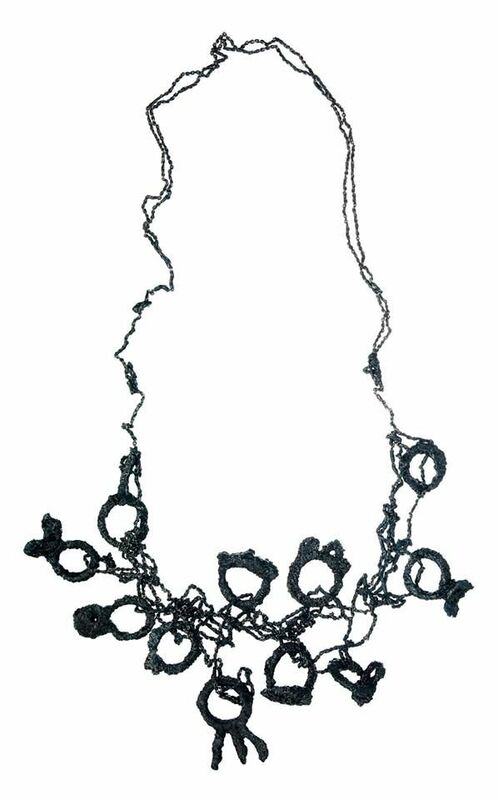 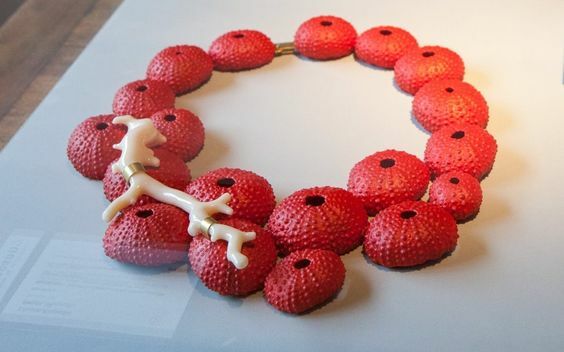 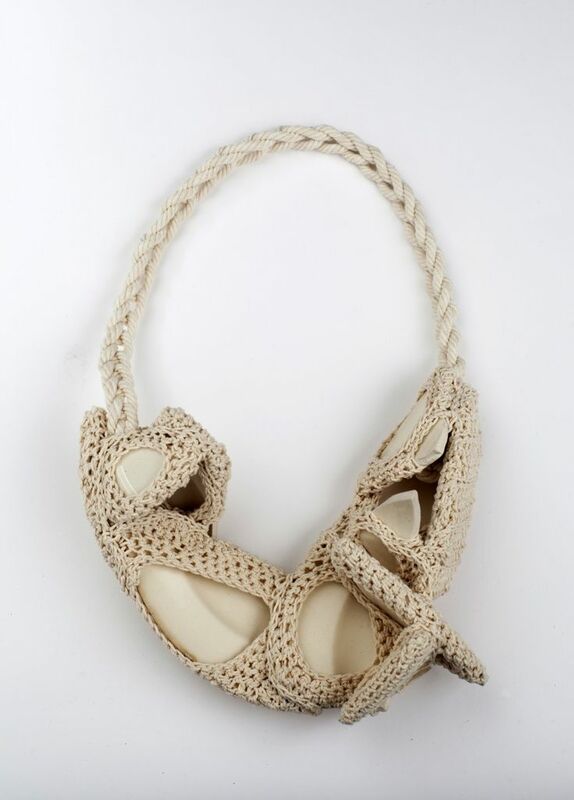 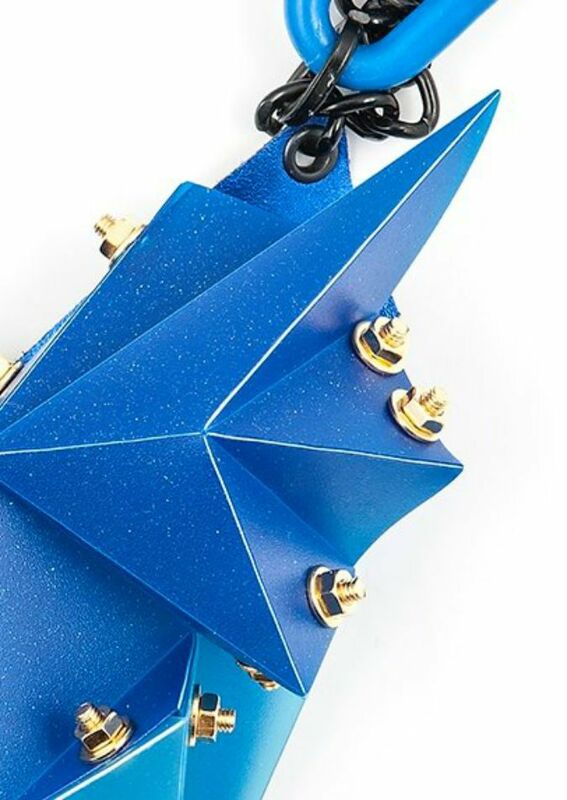 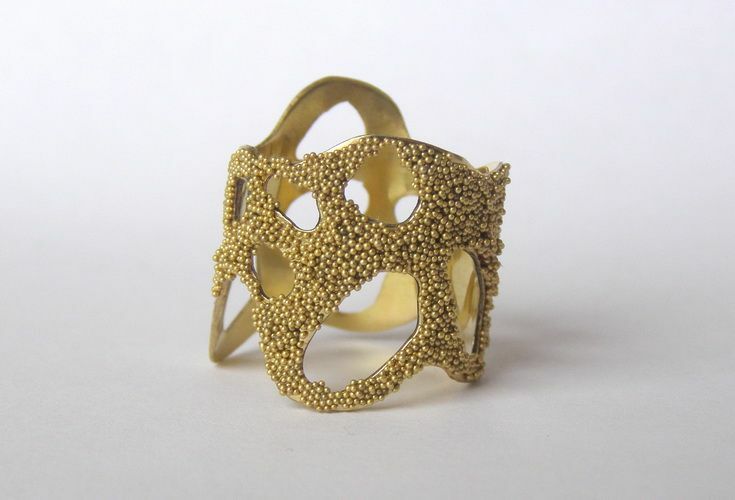 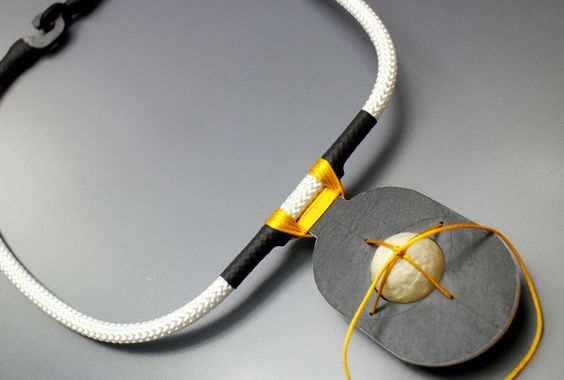 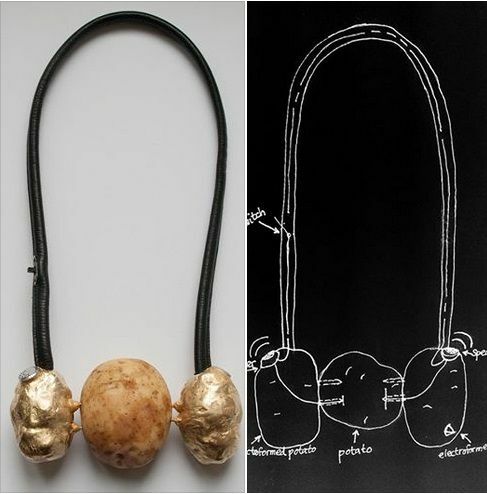 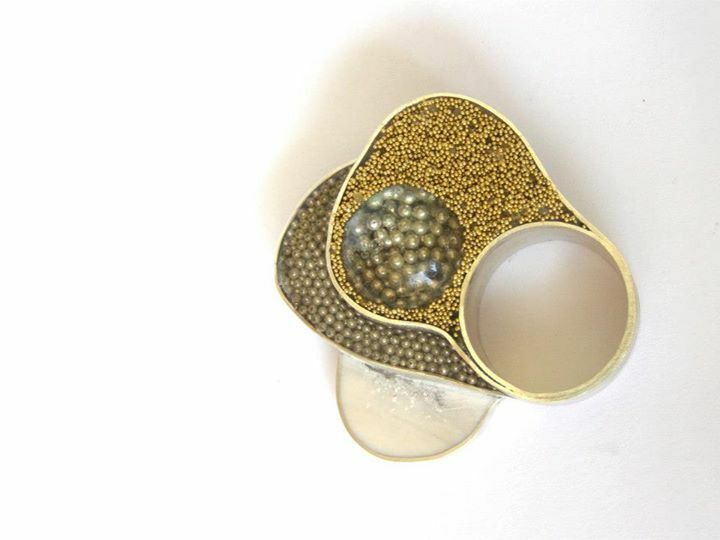 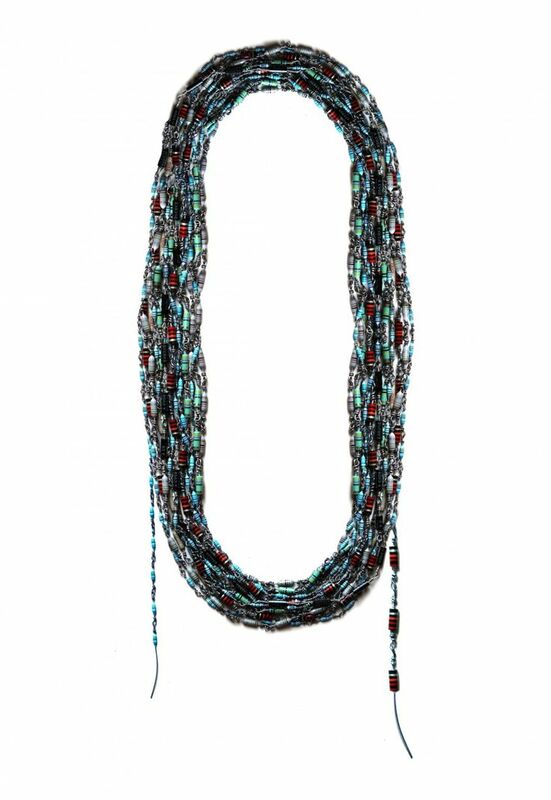 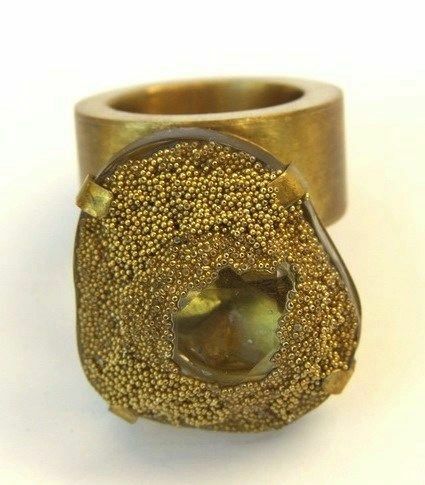 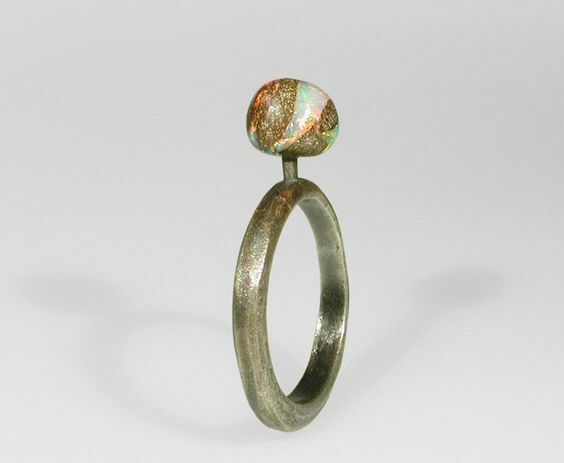 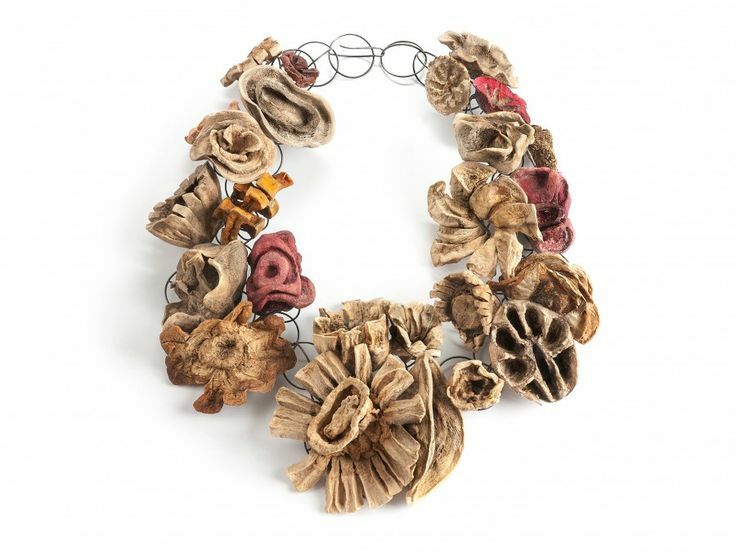 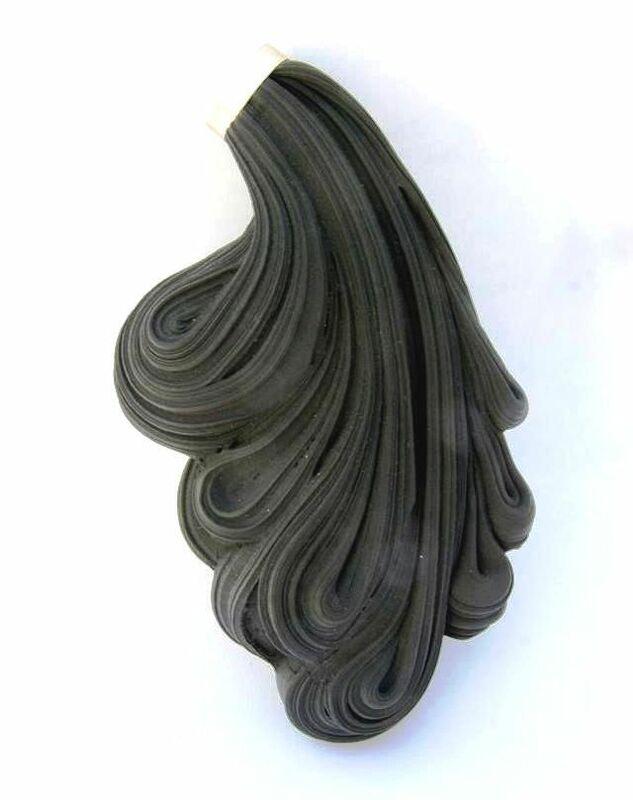 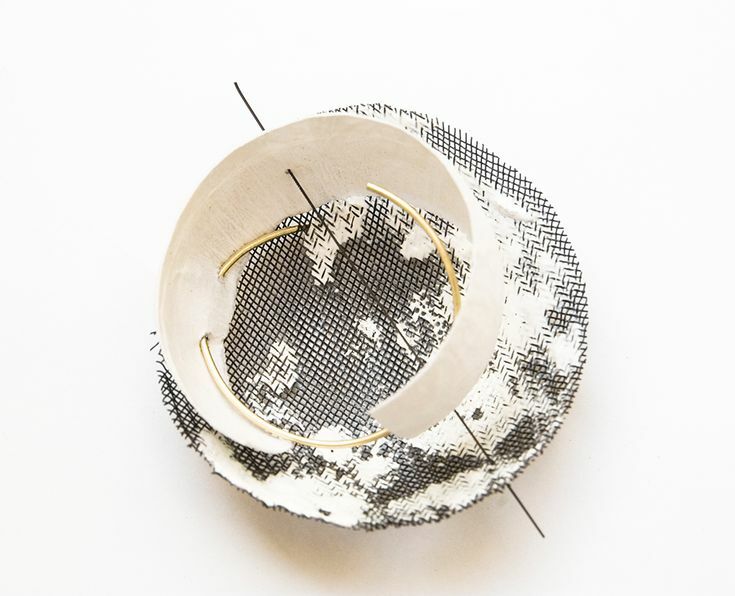 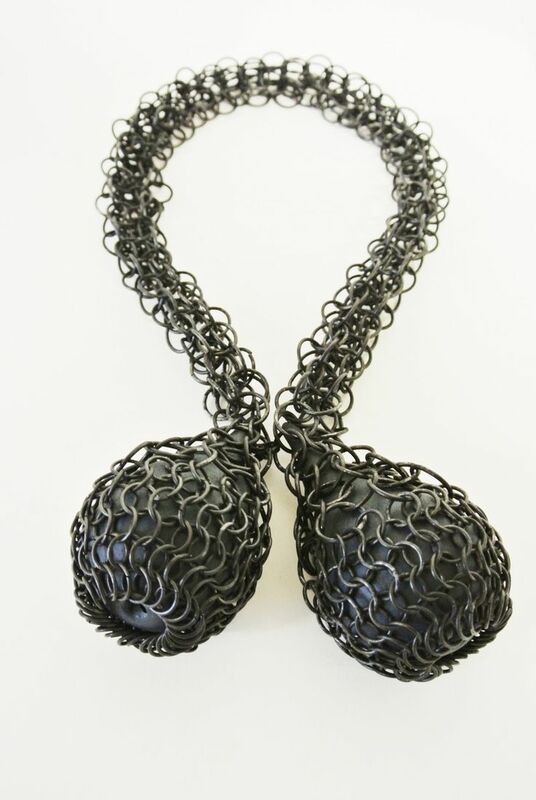 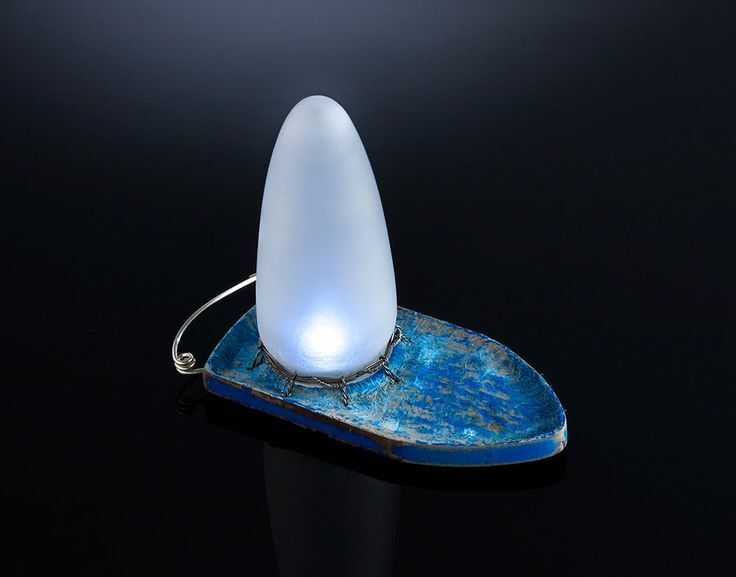 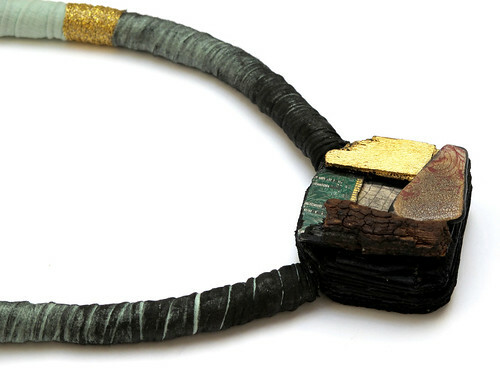 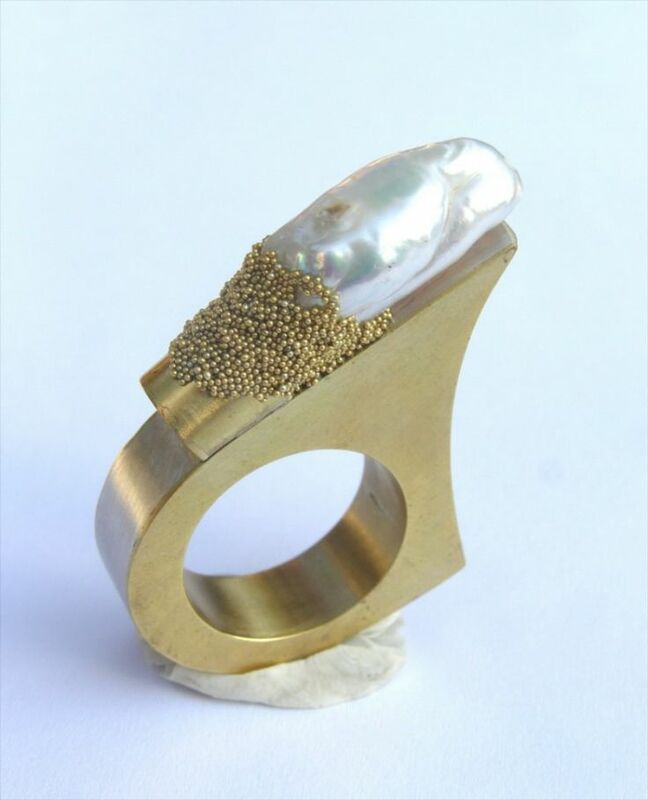 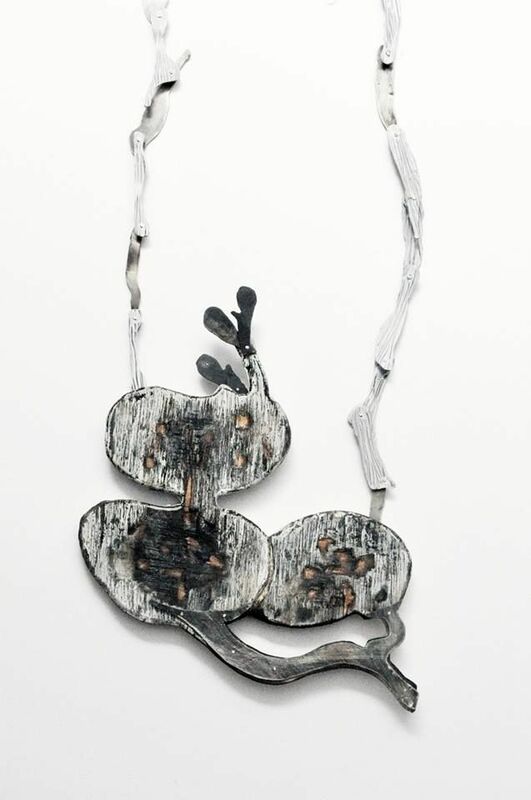 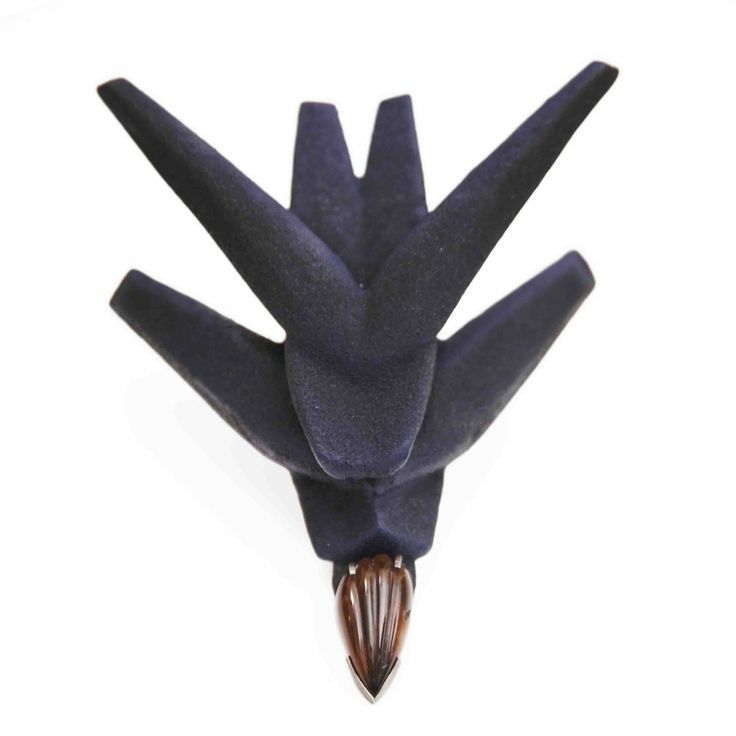 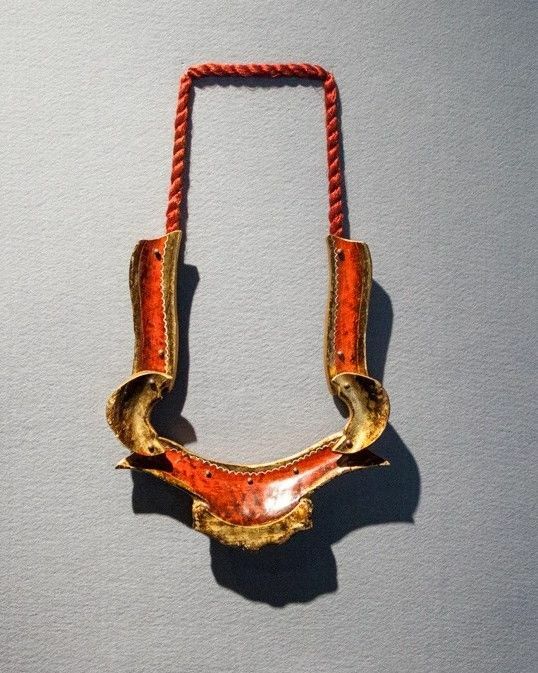 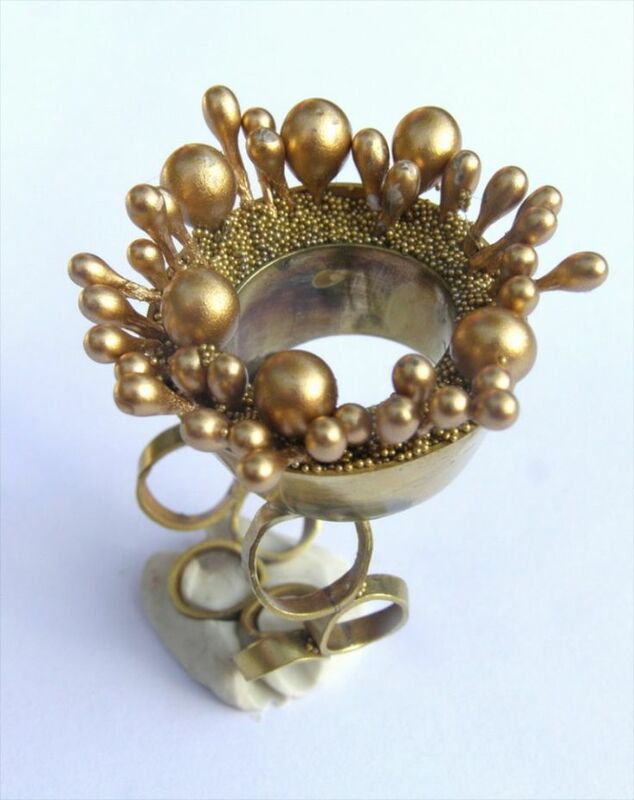 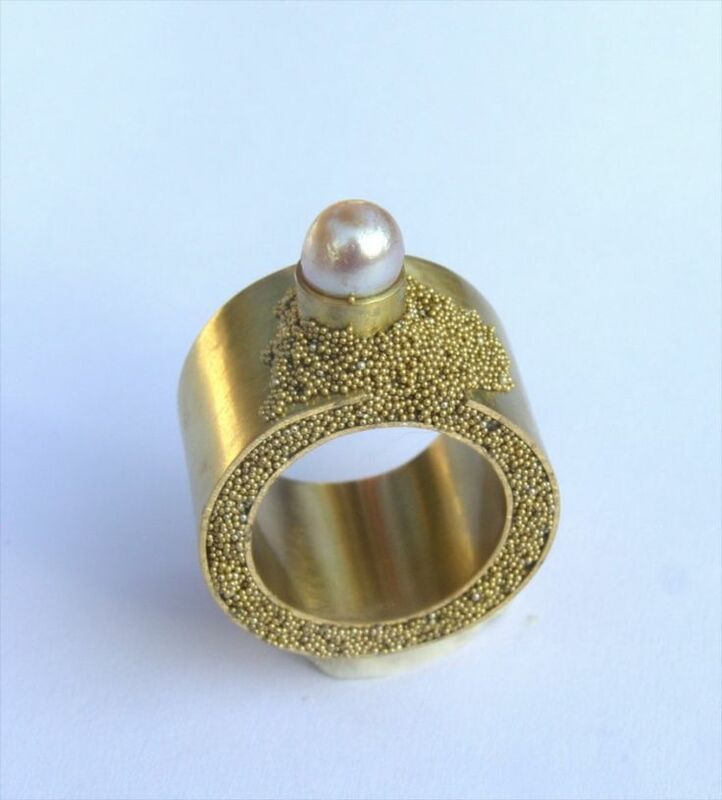 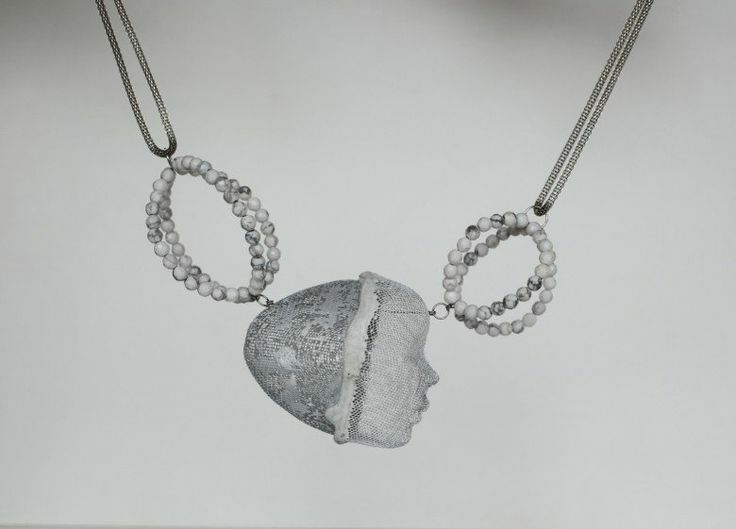 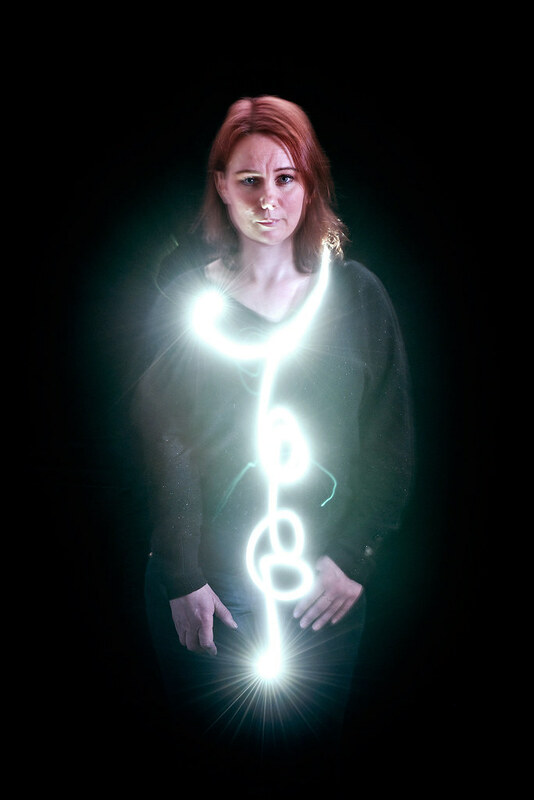 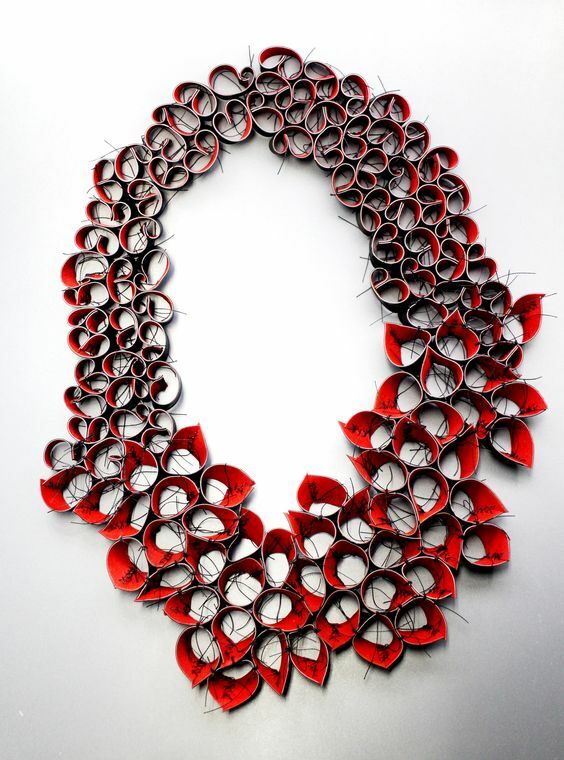 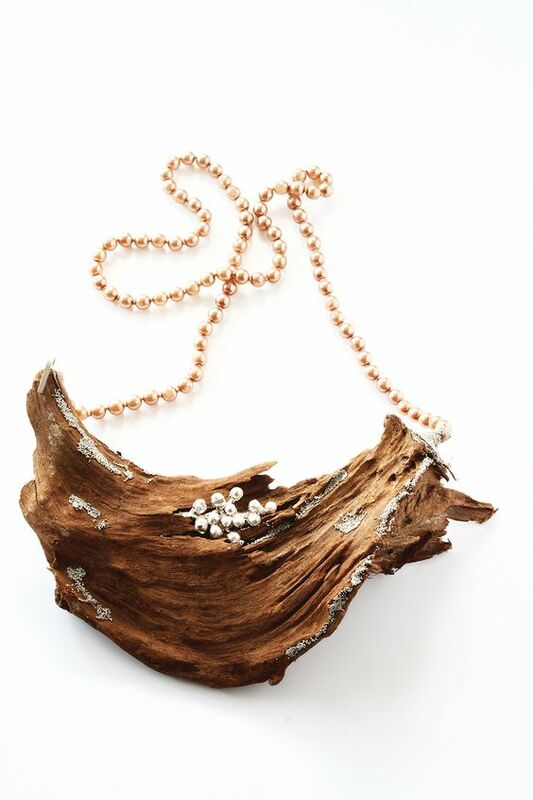 ), it’s about her jeweller’s work I’m interested in, her techniques, the materials she uses …. 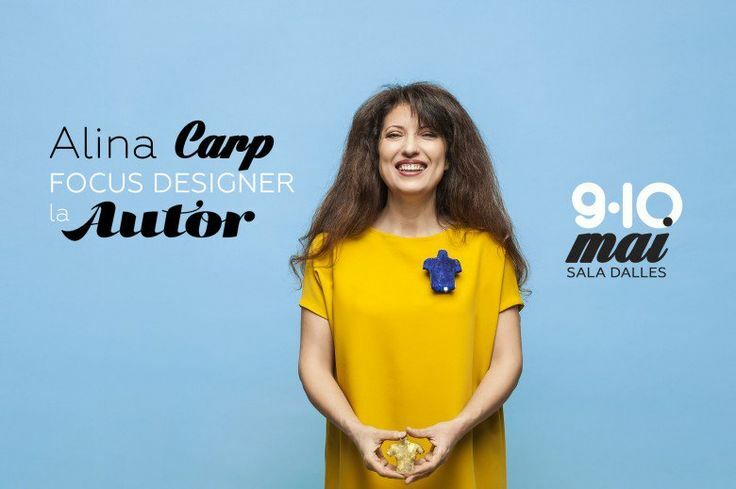 Alina Carp, winner of AAA (Autor Awesome Award) 2013 (AUTOR 10).